The Xray T4 2019 is the latest incarnation of the popular 4wd touring car platform. 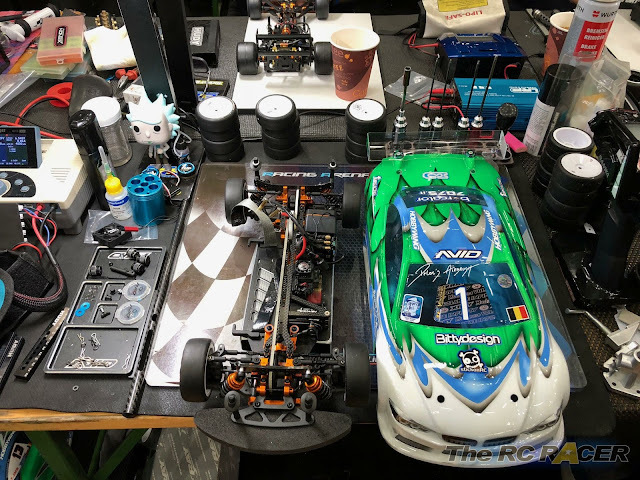 This T4 is a special car because it’s the car with which Bruno Coelho won the IFMAR 2018 World Championship. Xray started building touring cars back in 1999, and it’s the first time they won this most coveted title in the R/C industry. 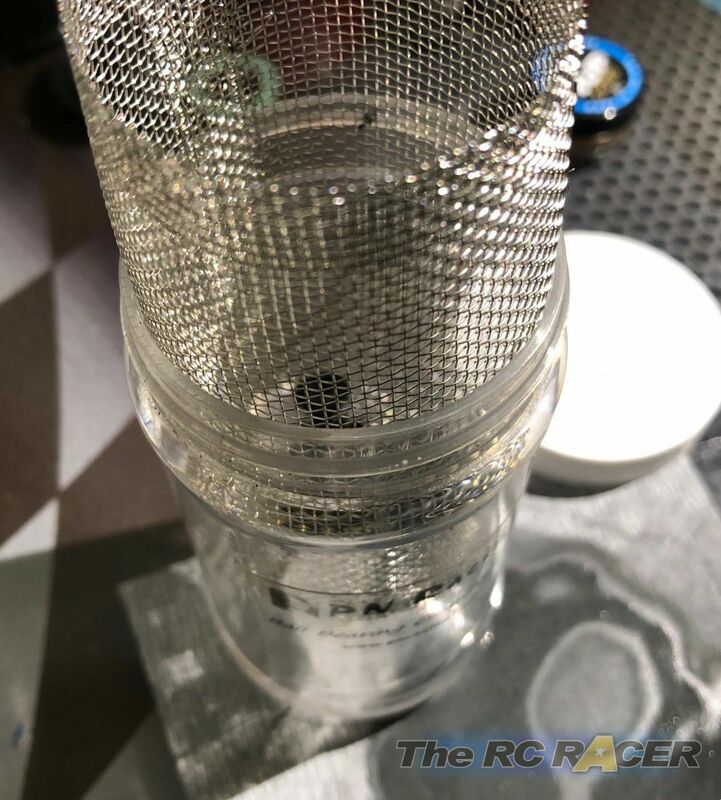 Let’s have a closer look at the innovations Xray used to win this title. BPA or body post adjustment. With this clever design, you can use one body and mount it neutral, 2mm to the front or 2mm to the back. The body position is a very important tuning aid. Before this innovation, you had to use different bodies in order to put them more forward or rearward. Now you can use a single body and adjust it. Beware that you will need to cut the wheel arches as otherwise the wheels might touch the body. An innovation that comes from the 1/8 scale cars is the new front flex stiffener. 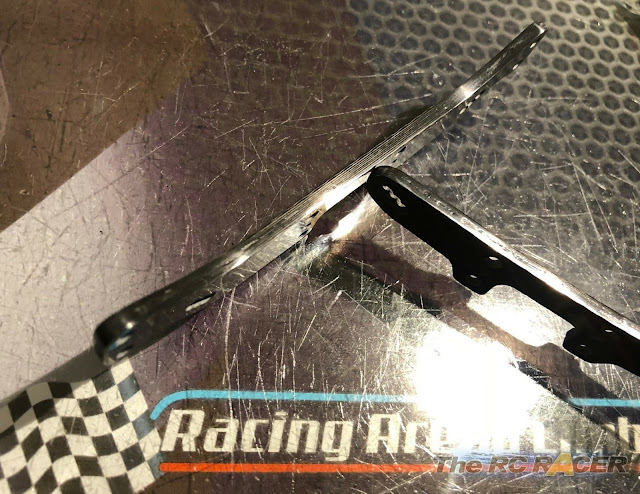 This alloy part allows you to make the front stiffer and give the car a more direct steering feeling. 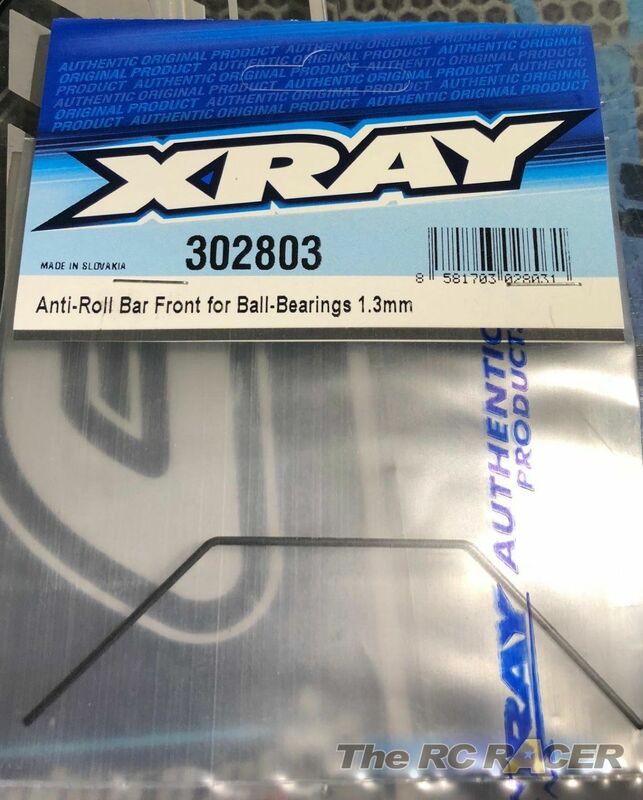 According to Xray it’s best to use it in low to medium grip conditions. 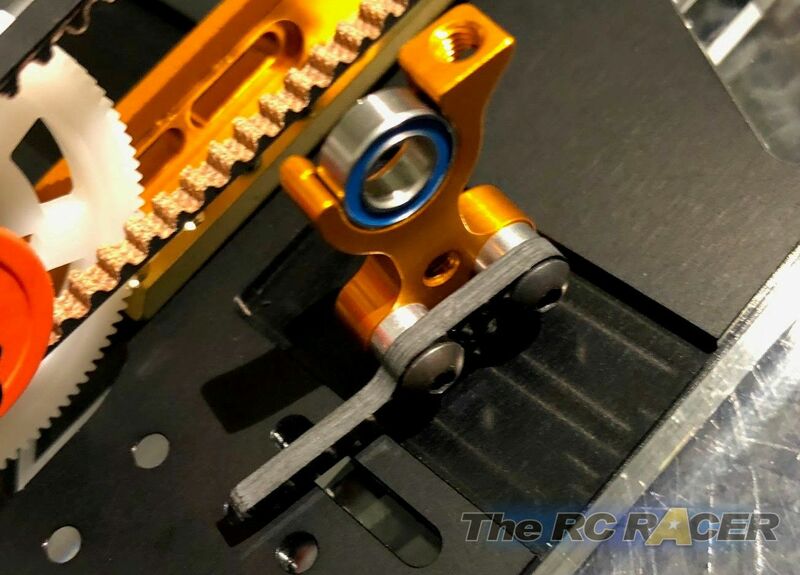 In order to make the steering assembly more direct, Xray also included a new steering bellcranck with pressed-in bearings. 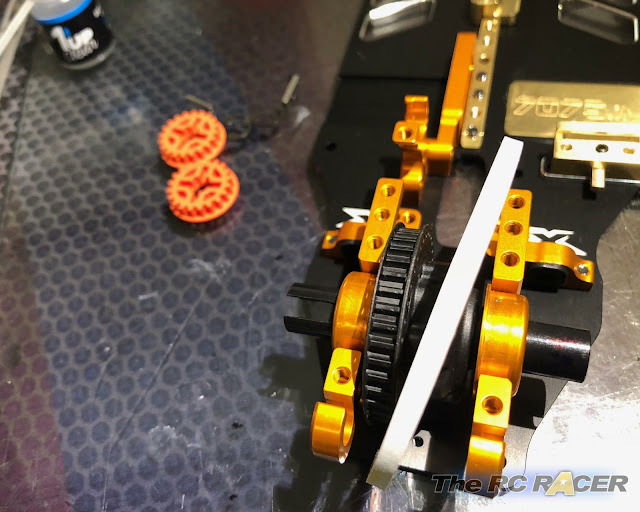 The 19 car also uses bushings that you can mount into the steering arms to get less slop. 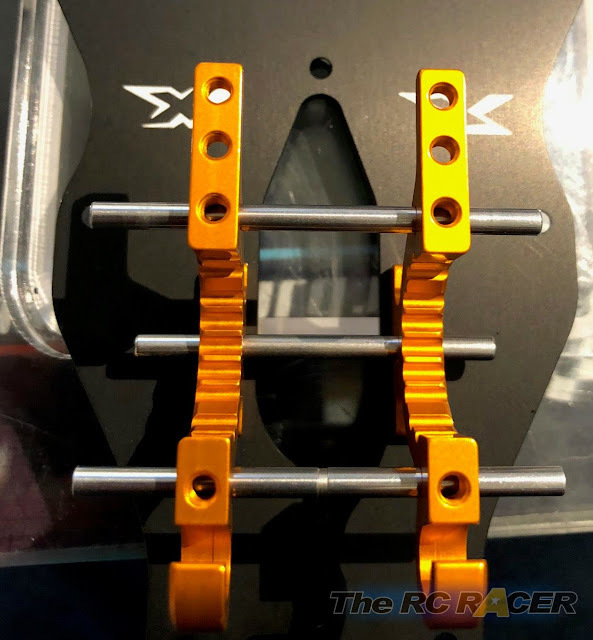 The dampers mounts have been updated as well. The shape remains the same,but they now have two extra holes to accommodate two pins that come out of the bulkhead. This is a neat solution to avoid tweak in case of a collision. 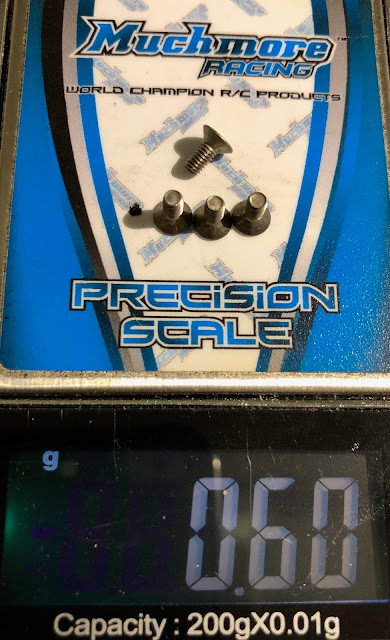 Adding the pins however adds weight, and as the weight is quite high up, Xray wanted to avoid this. That’s why they omitted two camber link holes. By doing so, the weight of the 19 part is lower than that of the 18 car, which is quite positive. 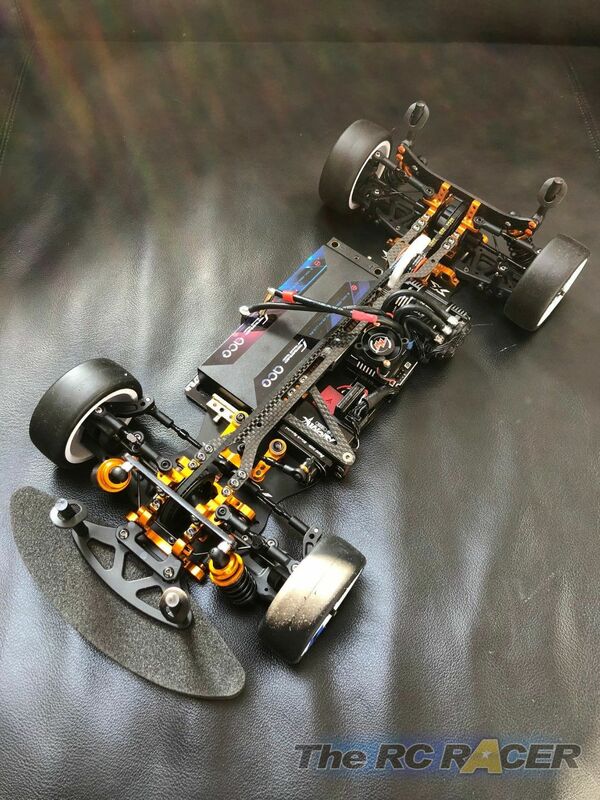 In this article I have built this car for modified racing. In the next part I will show which parts I would chose specifically for stock racing. As always, the Xray kit is well presented. It comes in a cardboard box with a nice colorful sleeve which shows the built car. All the parts are nicely packaged and the color manual is imho the best in the industry. 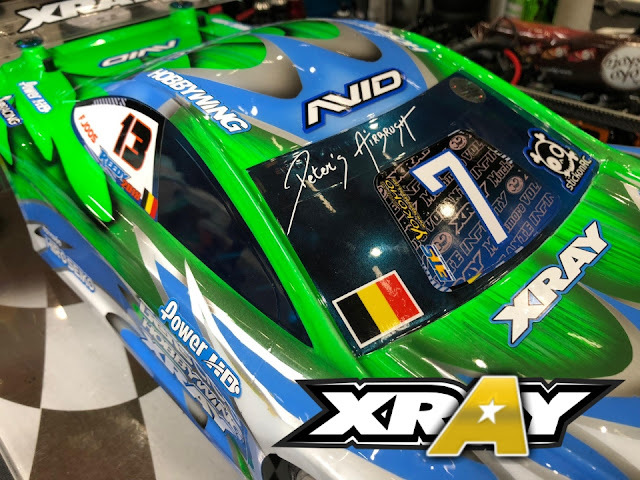 Xray is also one of the only R/C companies that still manufacture their cars in Europe. This is also a very positive part for me. This is perhaps the most annoying part of it all, as you have to prepare the parts before you can even start to assemble them. If you however take some time to do it, it will be very rewarding as it will make the maintenance afterwards easier. Apply some CA glue to the carbon part. I put some glue on a plastic can and then apply it with screwdriver. Let it rest and dry. It’s possible that the part will look horrible, but don’t worry, it’ll get better! 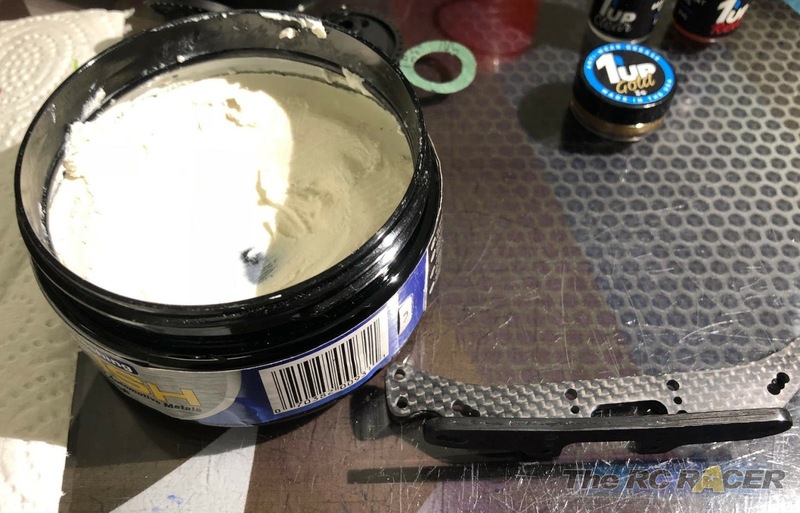 Take 400 grit sandpaper and sand the carbon part so that the bead is even. Apply glue again and slightly sand with 400 sandpaper again, then 1000 and then 2000. I also sanded the sides of the damper mount with 1000 sandpaper to get a matte finish. This contrasts with the shiny glue bead. You can polish the glue bead with some automotive polish. I also used the polish on all the hinge pins and damper shafts. 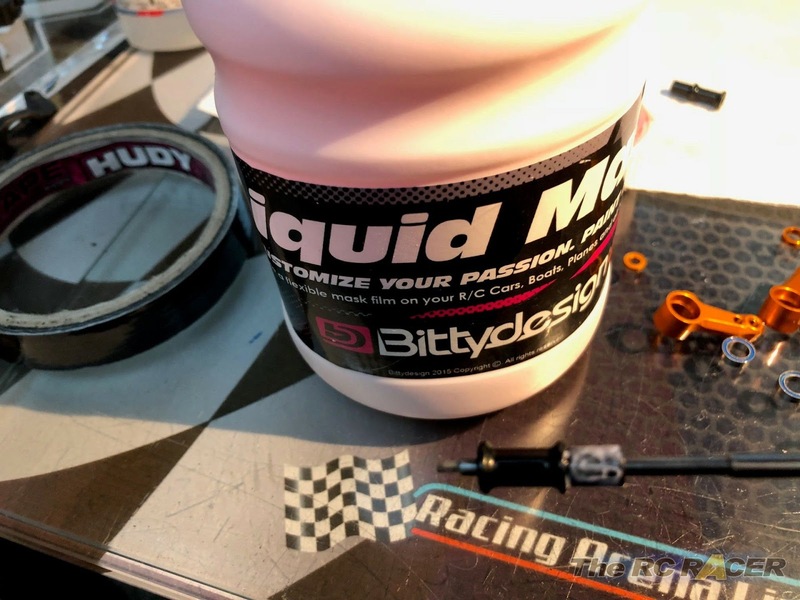 This will make them ultra smooth and you will have a perfect suspension. Before mounting the bevel gears, I slightly sand the bevel gears with 400 and 1000 sandpaper to make them smooth. After the underside has been wet-sanded, I put them in a small cleaning container, like this one from PN racing distributed by MARKA. The lube you use on the diff o-rings is very important. I recently discovered a nice range of products from 1up Racing. 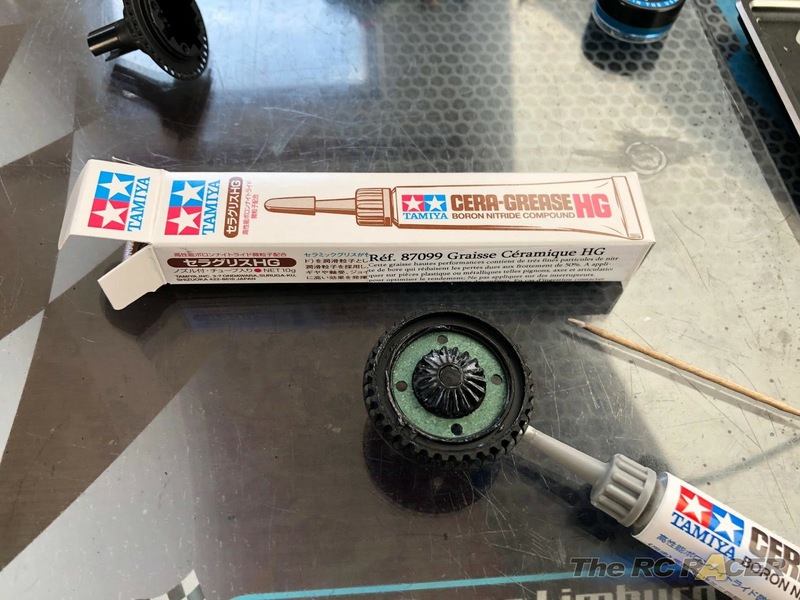 Their Blue Grease is great stuff to put on the shock and diff o-rings. Before filling the diff with silicon oil, I put some Tamiya Ceramic grease on the satellites. I then closed the gear diff and ran it in by hand. Once finished, I put 6000 Tornado oil in and filled it with 1.4 grams of oil. 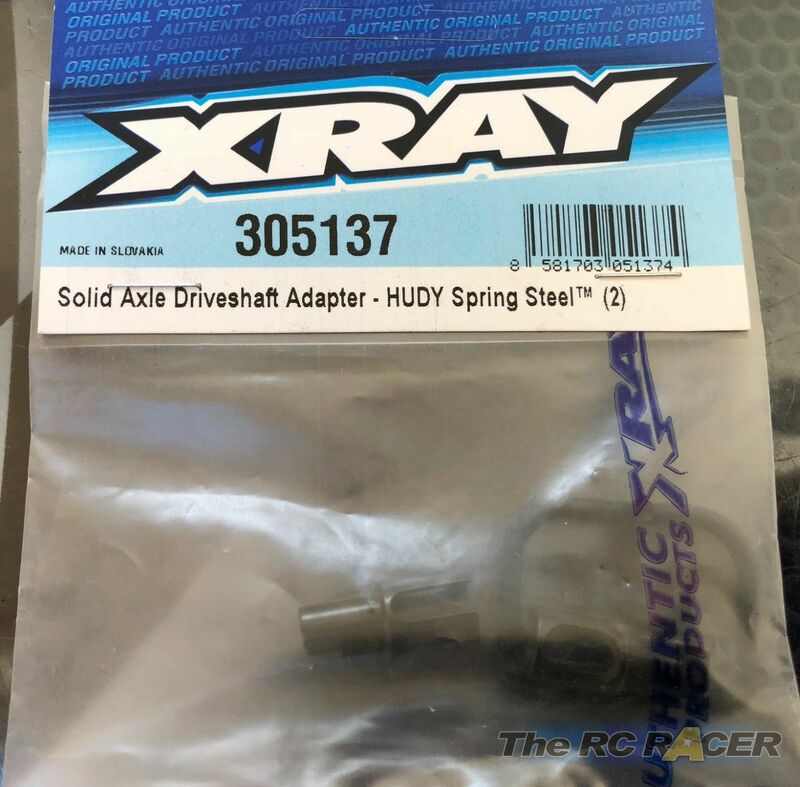 For the front spool, I used the Xray Solid axle driveshaft adapters in spring steel (item 305137). This is really a must have if you are doing modified. I used a PowerHd Storm 7 servo. 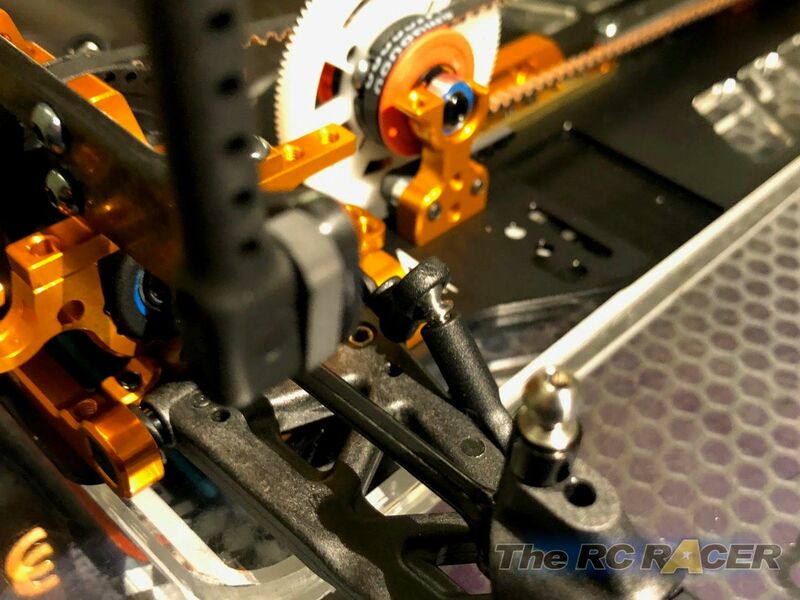 We've used this servo for over a year now, and it gives Florian a very connected feel. 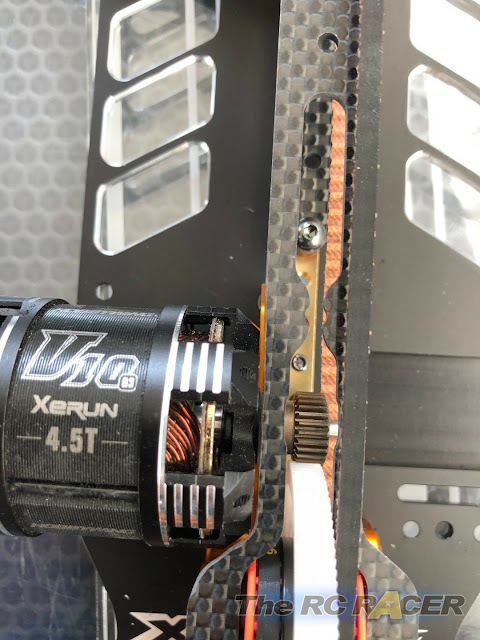 I used to shorten the servo leads, but that resulted in some DNF’s in the past. The aftermarket connectors I bought weren’t so good as the original ones, and they sometimes jumped out of the receiver. 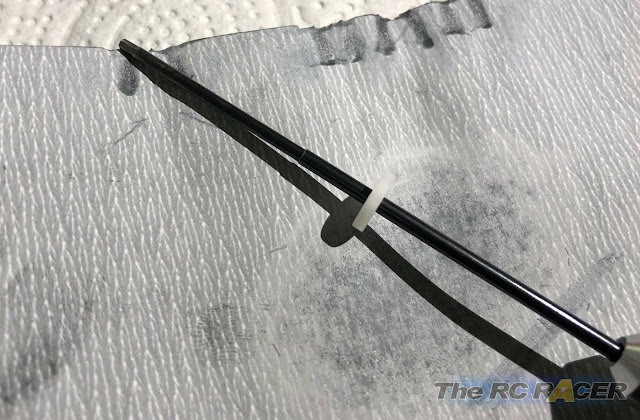 I therefore apply some black shrink tube to the servo wires and hide them. It’s not so neat, but it works better! I've already polished the shock shafts, so I didn’t have any extra work to do on them. 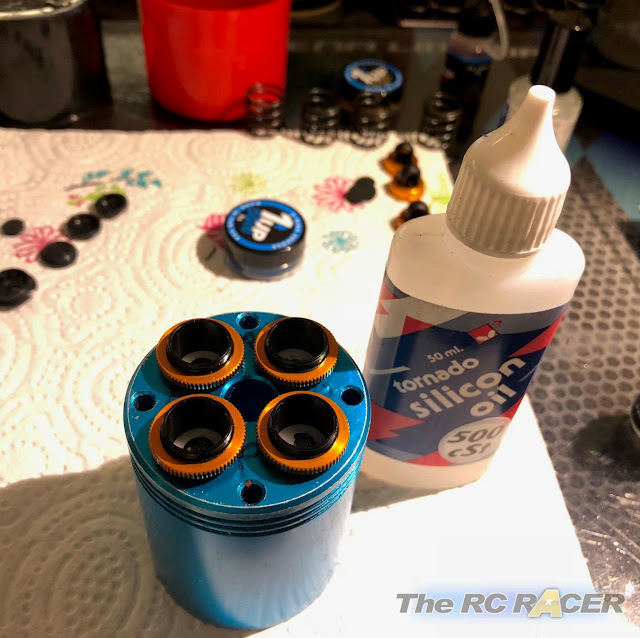 I slightly sanded the pistons with 2000 grit sandpaper to remove any blemishes. 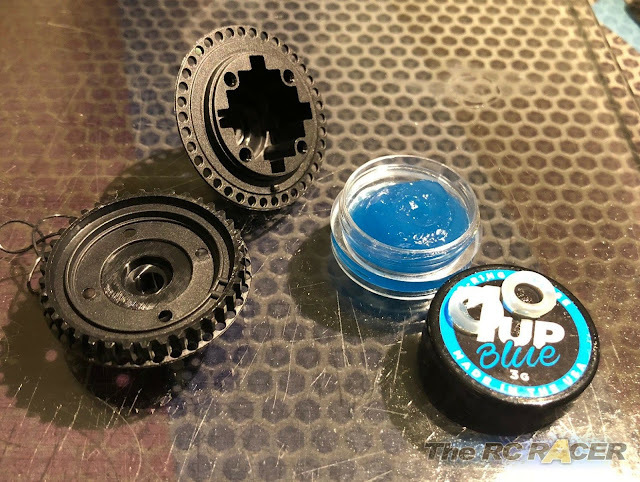 I slightly coat the O-rings in 1up blue grease, which makes them leak and sweat-free. 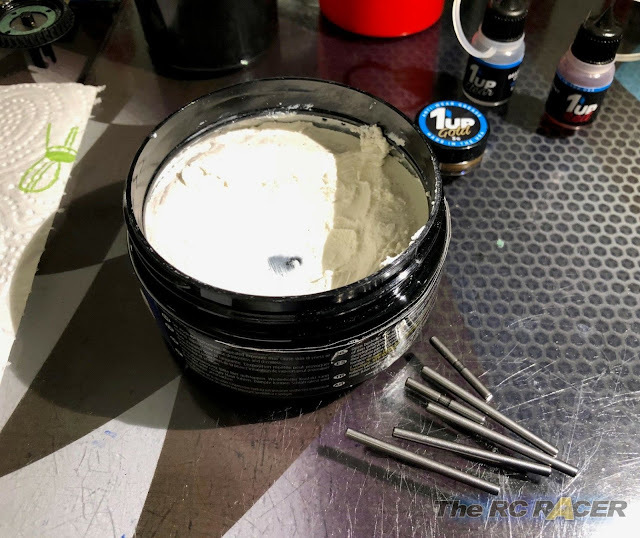 I also put some Tamiya Fluorine coating fluid on the suspension balls to make them mover more freely inside the plastic cups. 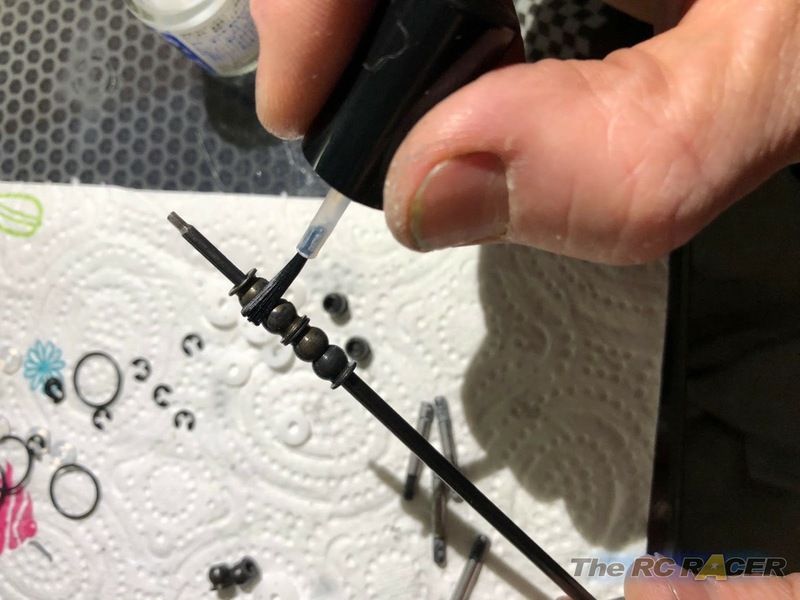 When the piston is mounted on the shaft and the shocks assembled, I put some 1up clear oil on the shock shaft before inserting it in the o-ring. It is also important not to tighten the shock collar as this might damage the o-ring. Once done, I filled the shocks with Tornado 500 oil and let them rest for a while. If you want to know how you can build the perfect shock, have a look at Dominic Queck’s excellent video on Youtube. 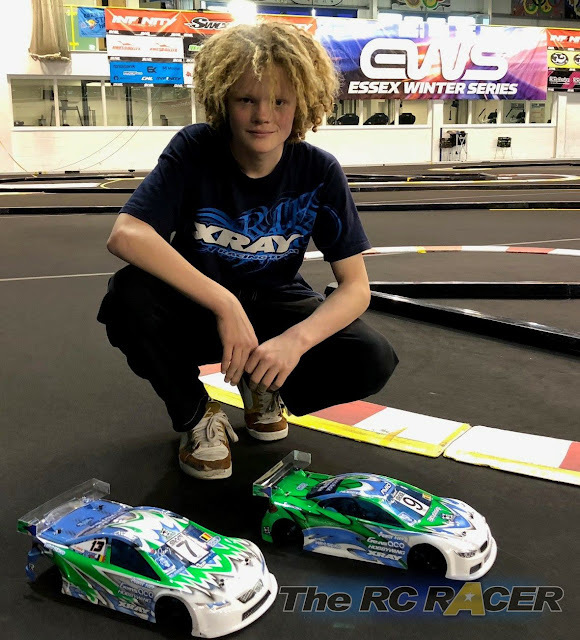 Dominic is an Xray factory team driver and made great video especially for the super short shocks. The spur gear is held with 3 steel screws, which weigh in at 1.03 grams. 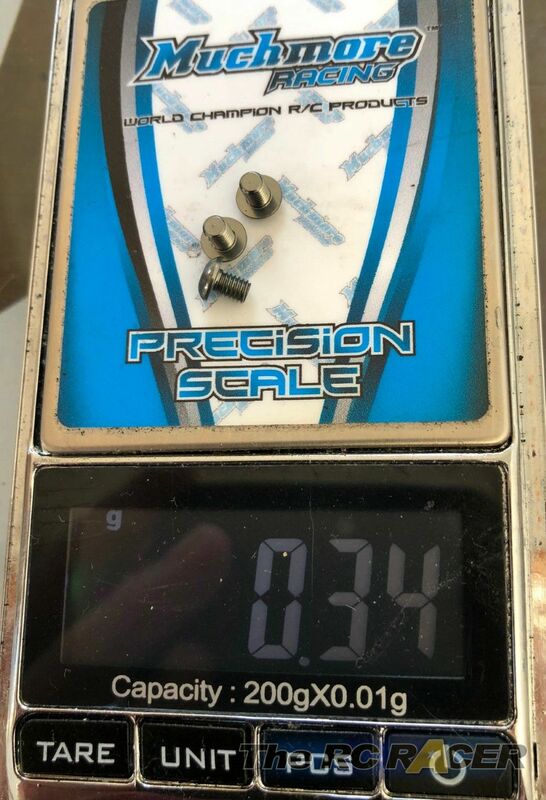 I replaced them with 3 Hiro Seiko 3 x 5mm screws which only weigh 0.34 grams. It might not seem much, but as it is rotational mass, every weight saving is important. 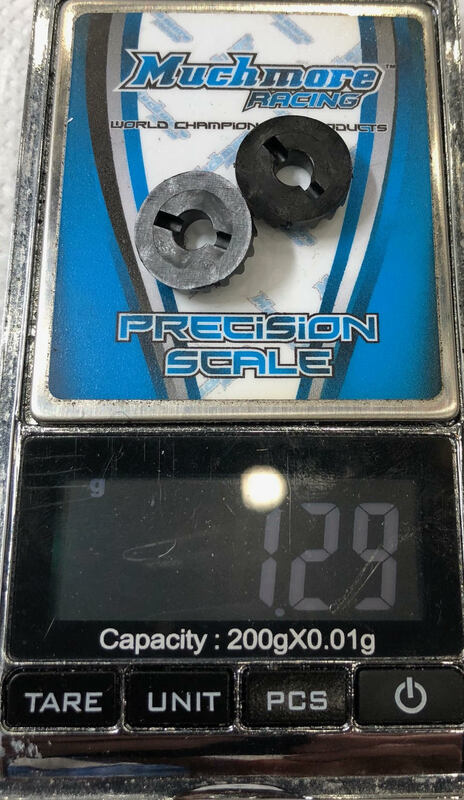 That is also the reason why I use the composite 20T pulleys (Xray item 305577), as they are 0.26 lighter then the stock parts. Just with those 2 parts I almost shaved 1gram off :). The diff pulleys sometimes develop some play. 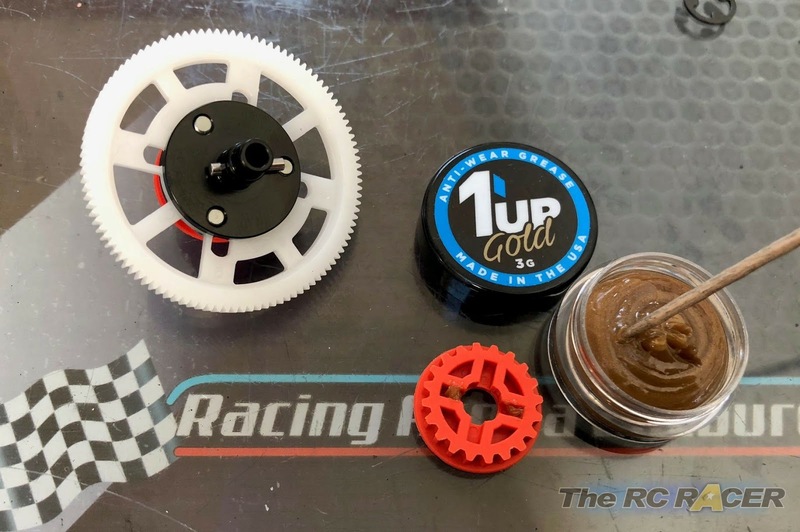 That’s why I put some 1up Gold grease inside the pulleys where the axles sit. 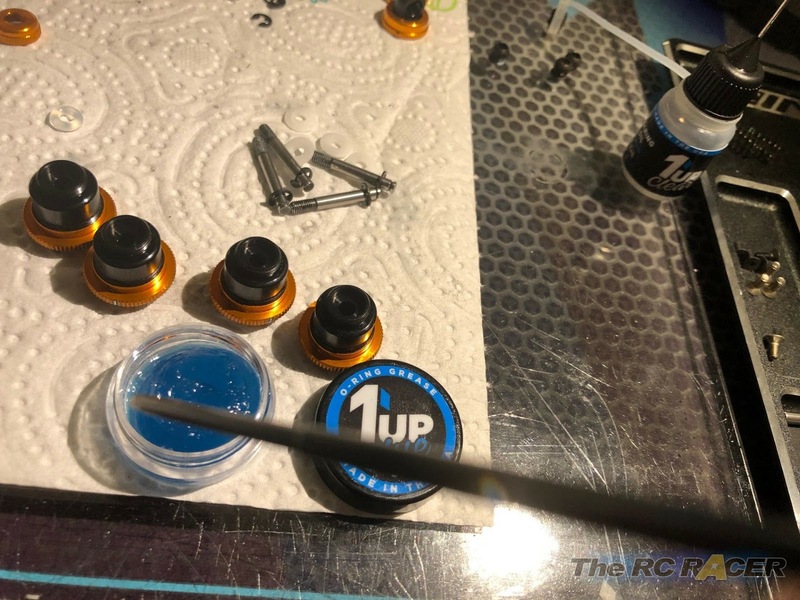 I also used the 1Up red oil when mounting the drive shafts. 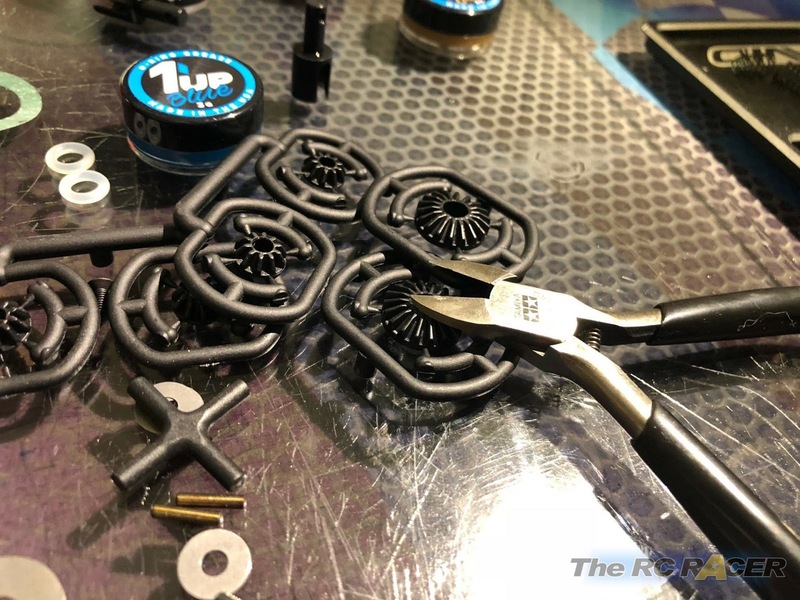 I used to put grease on them, but ever since Jilles Groskamp showed me how he builds his, I limit myself to a very light oil. 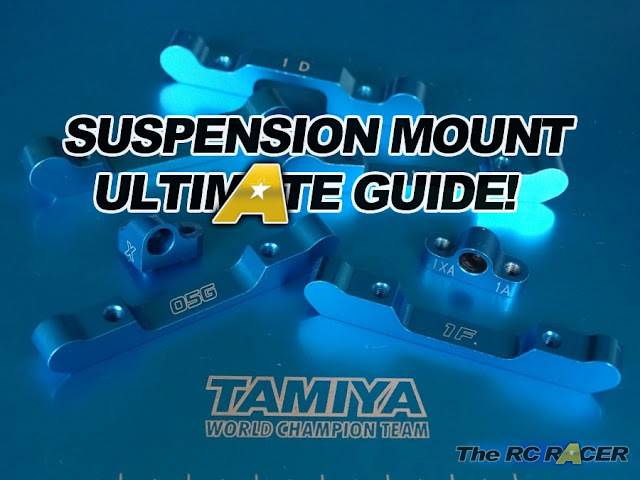 On a suspension, it is important to limit the unsprung weight. 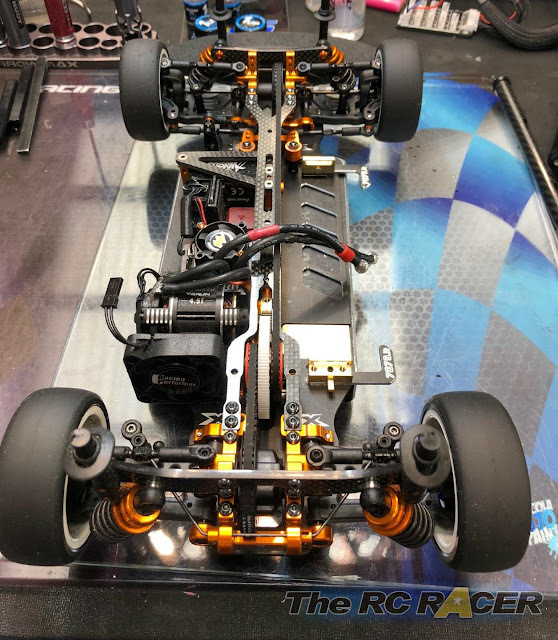 Unsprung mass includes the mass of components such as the wheel axles, wheel bearings, wheel hubs, tires, and a portion of the weight of driveshafts, springs, shock absorbers and suspension links. On our cars, you can’t really shave a lot of weight off. 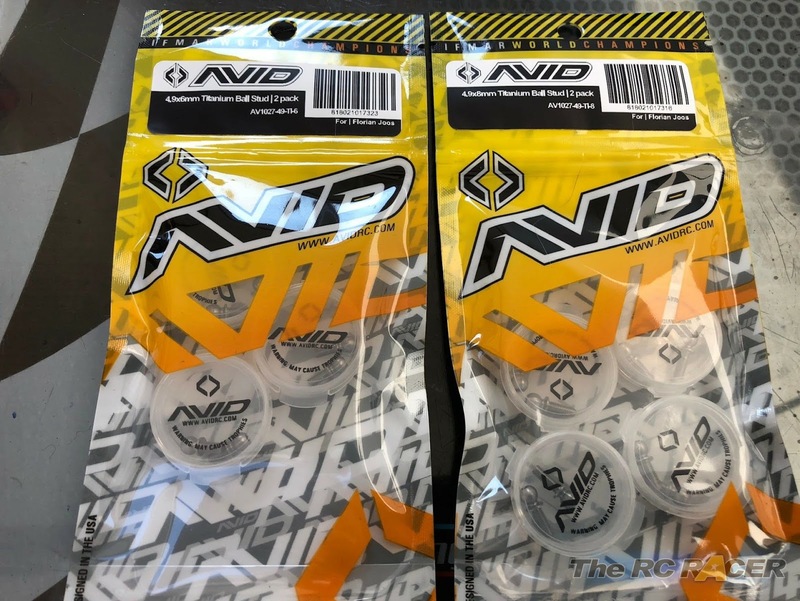 That’s why I decided to use some products that are designed by Avid. 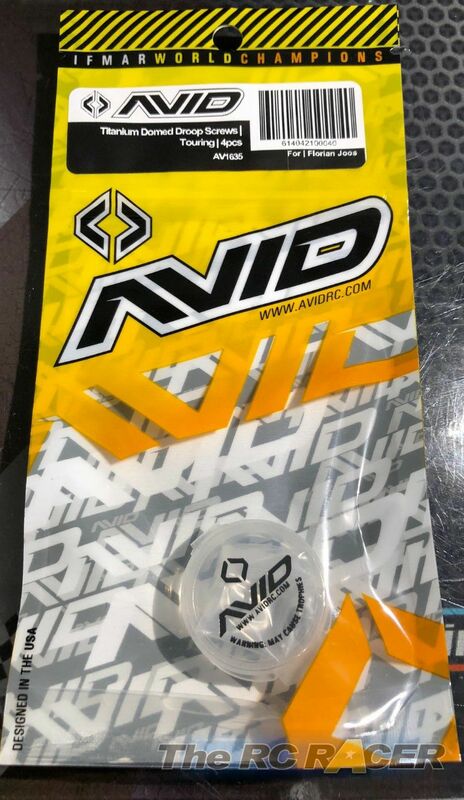 Instead of the stock droop screws, I use Avid’s titanium domed droop screws. 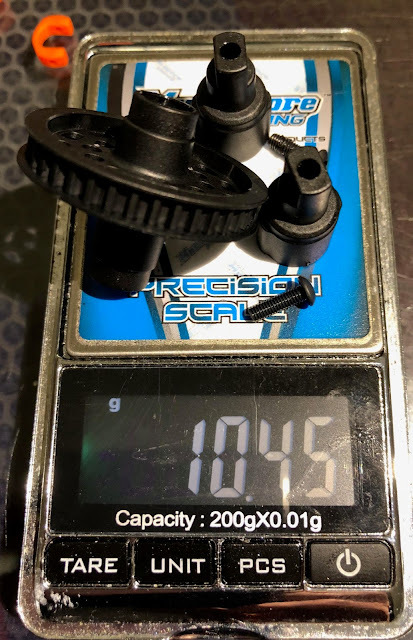 A set of 4 almost weighs 1 gram less then the stock parts. 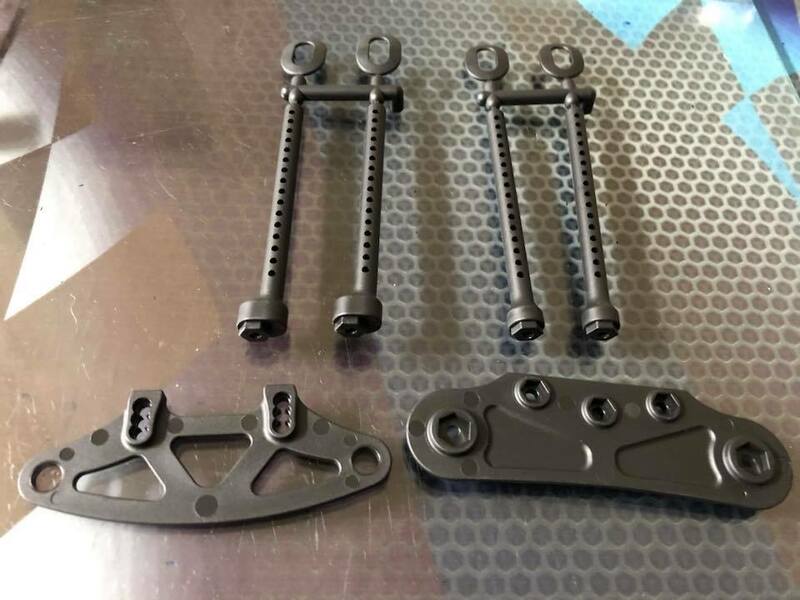 The Xray graphite parts are also lighter then the plastic parts. The ARS graphite arm is for instance 1 gram lighter than the plastic part. Avid also makes some rather cool titanium ball studs. 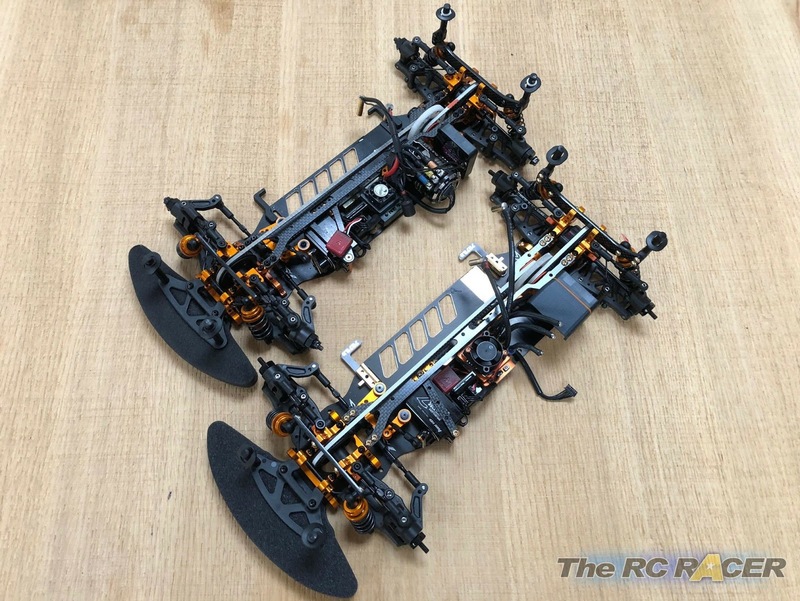 I didn’t buy the complete kit, just the outer parts and the ones for the stabilizers. By using these parts, I managed to shave 4 grams off of the un-sprung mass (Roughly 0.5g for each ball stud). The Avid products also come in handy containers, so you can store your original parts in the container and reuse the plastic bag the Avid products came in. The previous Xray T4’s were sometimes criticized for having slop in the steering arms. Xray addressed this problem in two ways. First they made a steering bellcranck with an improved design and pressed-in bearings. Secondly they added washers between the two ball bearings in the servo saver arm. 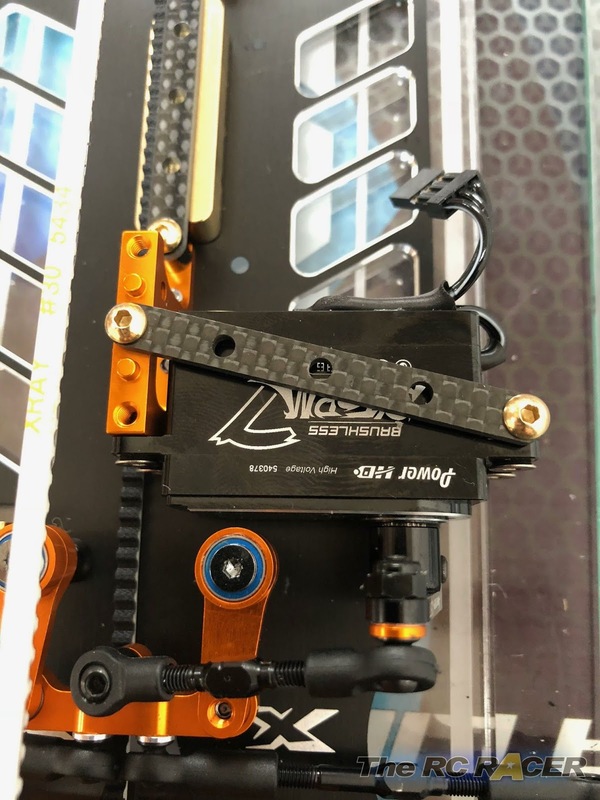 I bought the aluminum dual servo saver arm as it gives you a bit more steering throw. On the black servo saver holders I put some Bittydesign liquid mask. 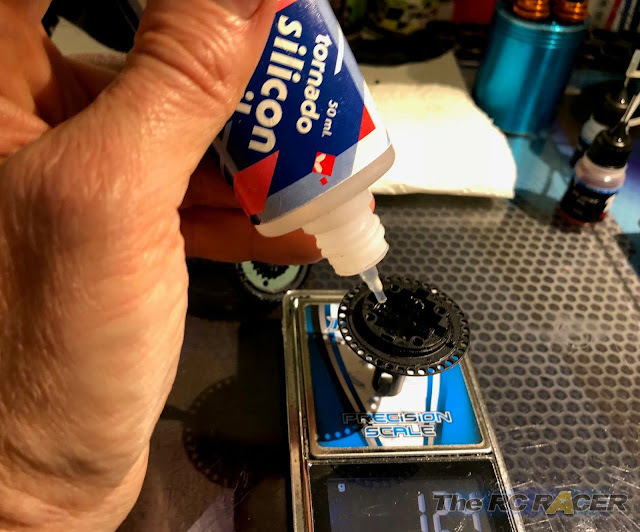 This will remove the play caused by the ball bearing on the servo saver holder. 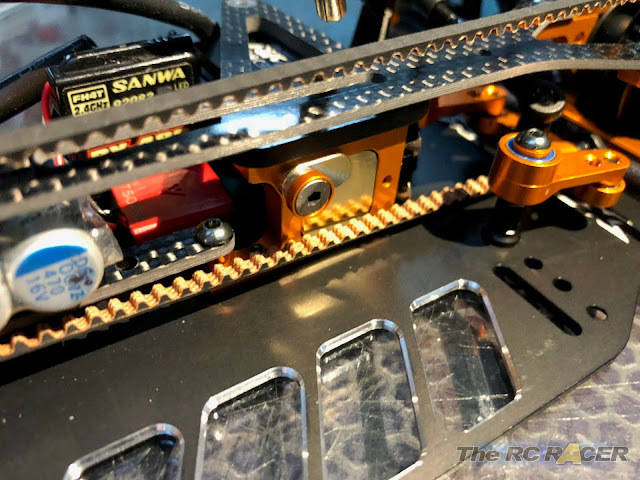 I then used some small shims to put between the screws and the servo saver arm. 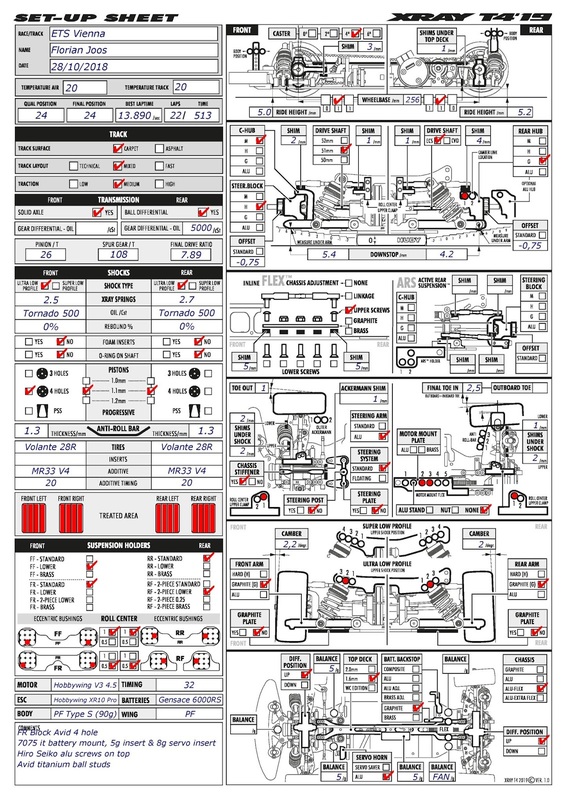 You will have to mount and disassemble the steering system to see where you need to put the shims. This way however you can remove most of the play. To be honest, we had a bit of play on the T4 18 car, but it was never dramatic nor did it have an influence on the performance. 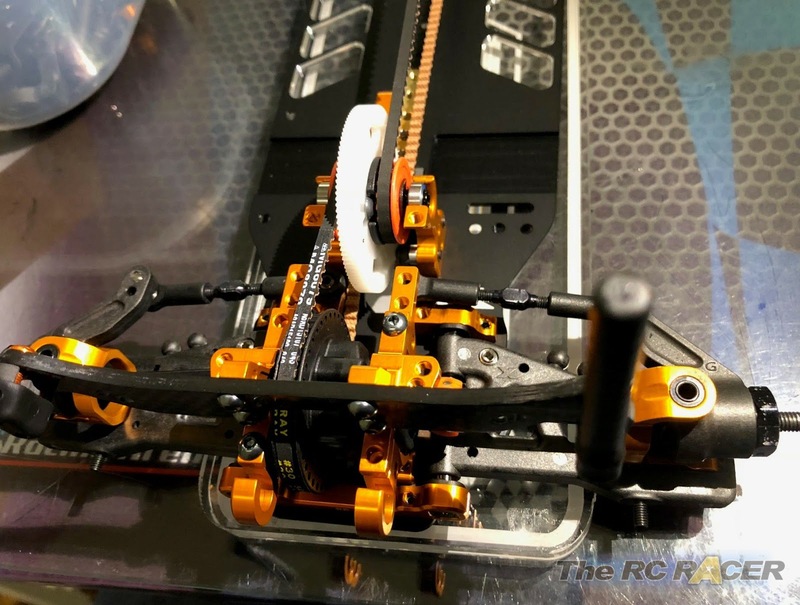 In the past I built other cars with much more play in the steering system. 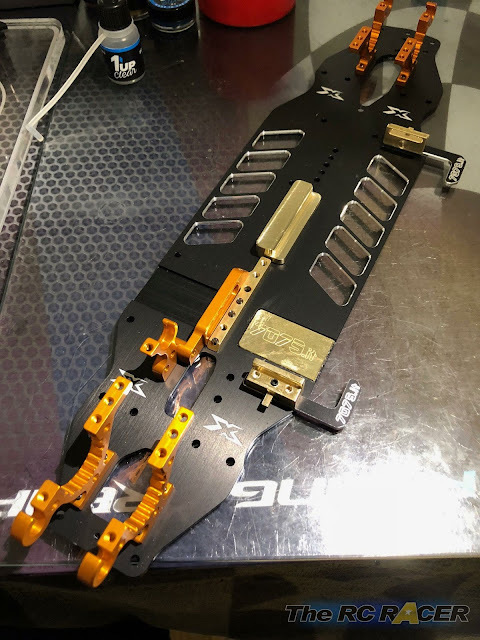 It was like Christmas when I got the T419 alu flex chassis (Xray 301150), because I could start building the rest of the car. The 19 chassis is the same as the 18 chassis, except for the front section. 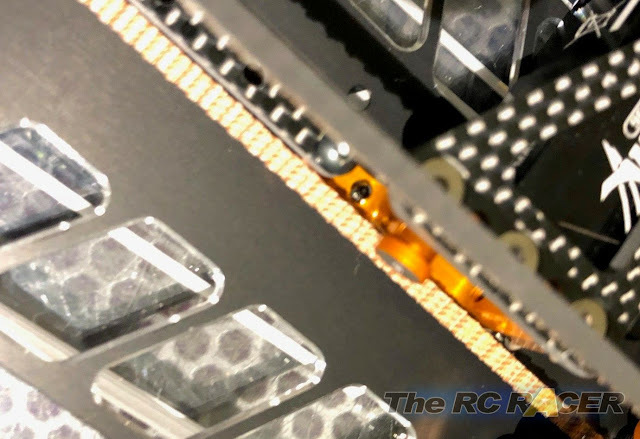 There are two more holes which will allow you to mount an alu flex bar. 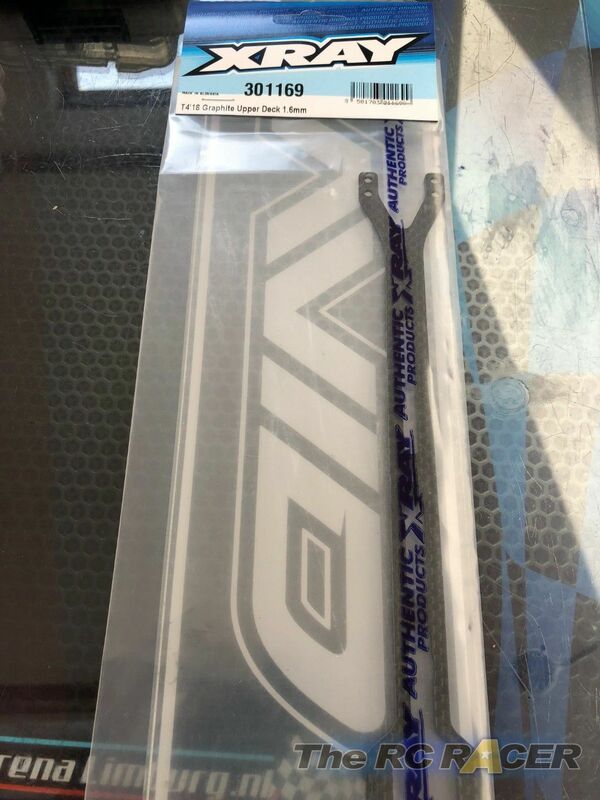 This bar will increase initial steering in low to medium grip conditions. The front opening also seems to be slightly bigger. First thing you have to do is mount the bulkheads. 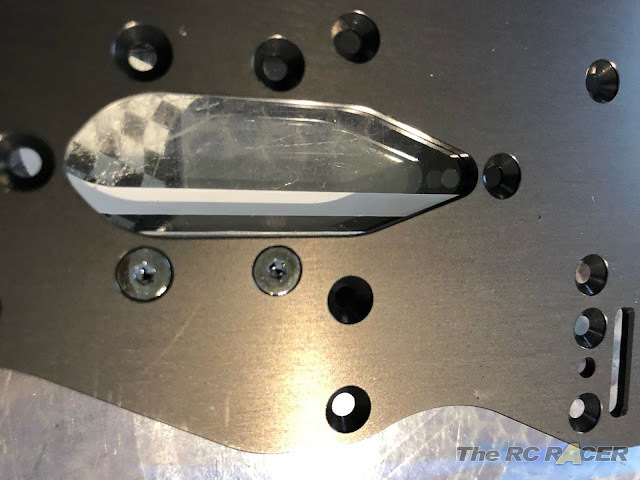 Even though with modern technology all the machined parts would give a perfect fit, it is always recommended to use some kind of jig to align the bulkheads. You have two options. 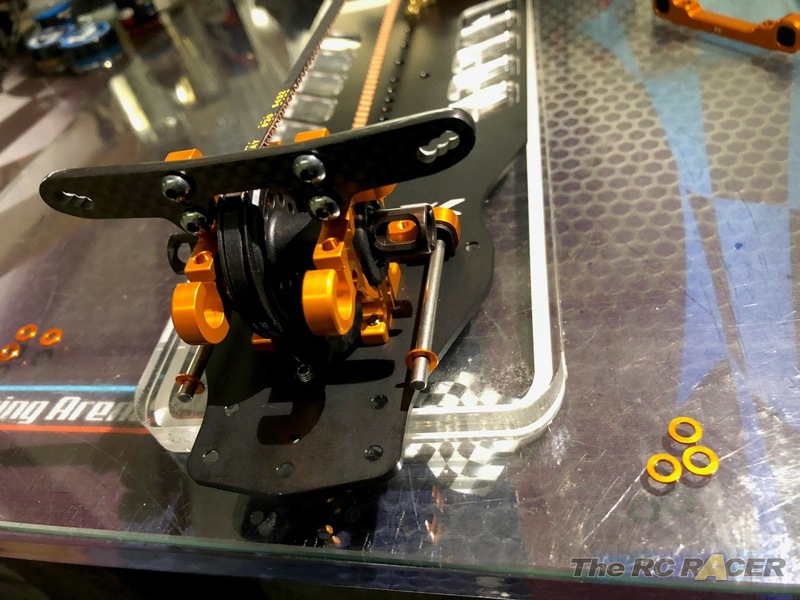 You can either buy the RC Mission bulkhead jig, or you can use 3 suspension axles. Just fit them in and slightly tighten the 4 screws on the lower bulkhead. At any time, they should move freely, and almost drop out by themselves. Repeat this procedure for the front and rear bulkheads. Instead of the aluminum motor mount plate I used the Xray brass one (Xray 303004) as it adds a bit of weight on the right places. New for the 19 are also the smaller ball bearings (they don’t interfere with the top deck flex anymore) and the neat graphite battery stopper. I also mounted the front graphite brace to see how it would work. 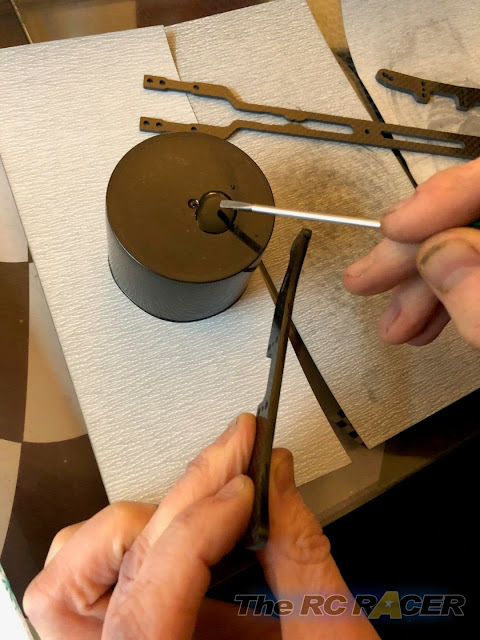 The screws used are steel satin grey Hiro Seiko screws. For the lower chassis I always use steel screws and the Hiro Seiko ones just look a bit better! 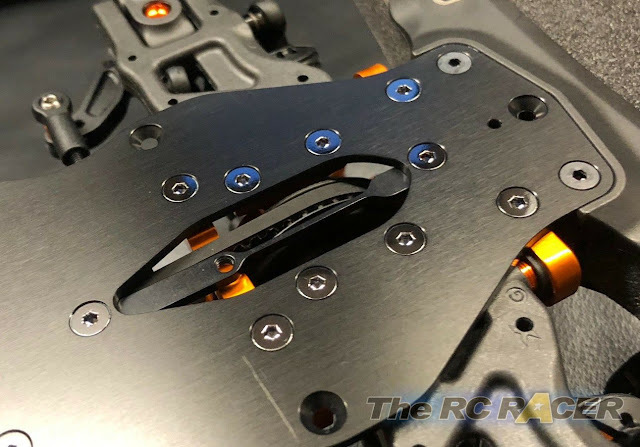 The suspension mounts underwent a cosmetically change and now feature rounded corners. Personally I also think that this would give less risk of breakage in a high speed crash. With the suspension mounts added, it’s now time to mount the suspension arms. 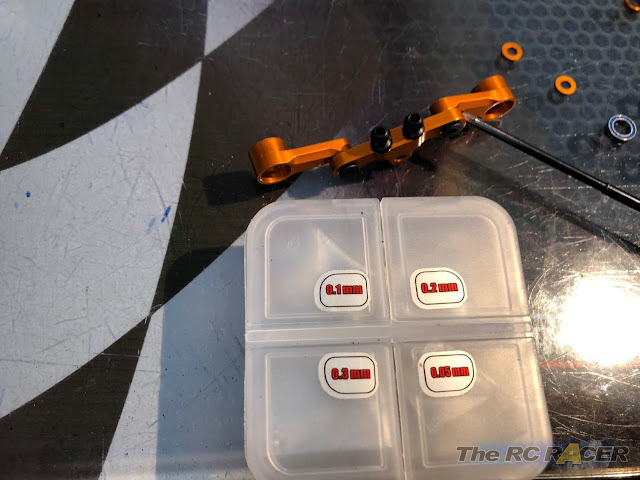 I use 0.5mm shims up front instead of the 1mm shims. 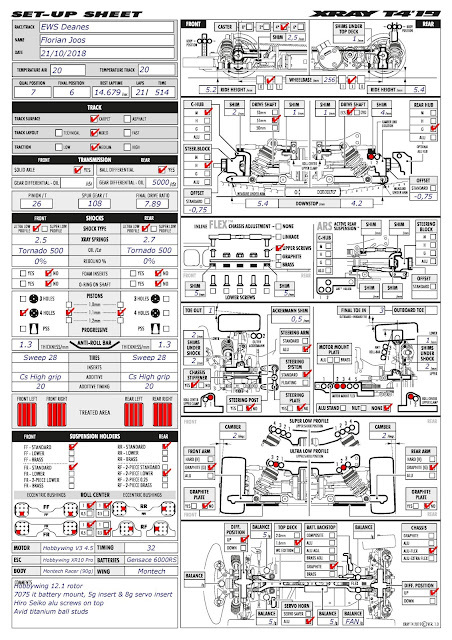 This gives you a bit more room to fine-tune the wheelbase. In this picture I mounted the ARS suspension with the optional aluminum c hubs, but I will take them off for the carpet races. 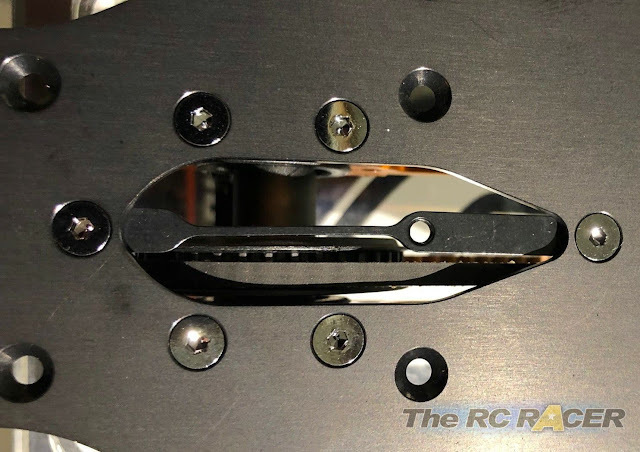 I also cut the front part of the servo mount graphite bar off. We don’t use it and it’s weight that is relatively high placed. Instead of the 5mm wheel hexes, I used 2 sets of the -0,75 hexes to give the car a sharper feel. It will have faster directional changes with these hexes (Xray 305351). Suspension with the Avid titanium ball studs. Xray have a really neat system to mount the stabilizer bars. Instead of using the 1.4 front anti roll bar, I installed the 1.3 one (Xray 302803). 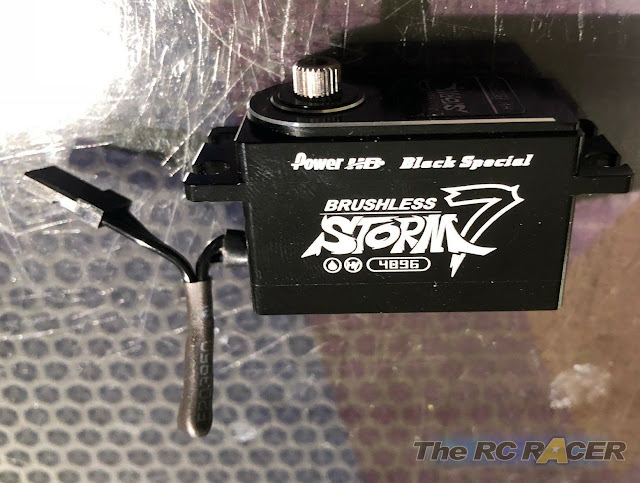 There is also a new front battery stopper that you can adjust to any kind of Lipo pack. 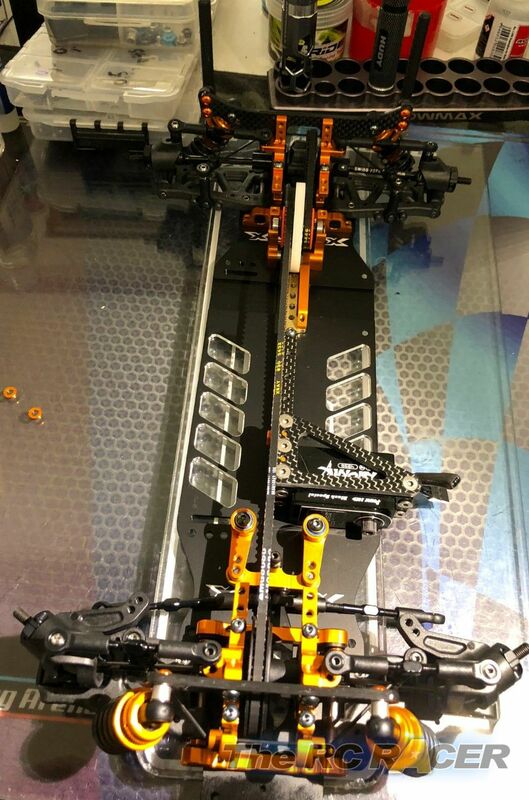 With the main chassis finished, it’s time to mount the top deck. 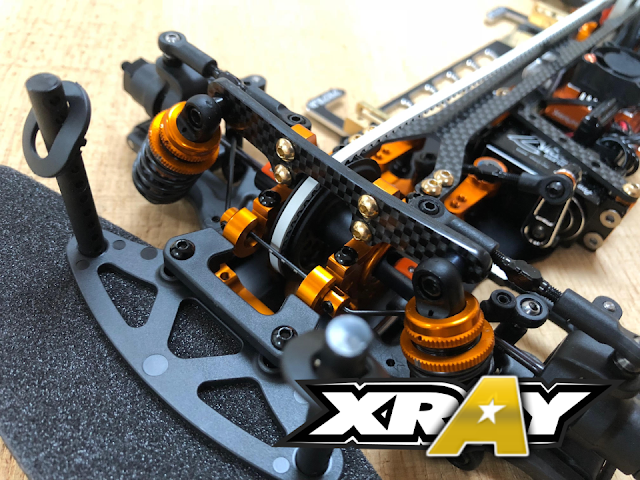 On carpet, most team drivers run the 1.6 topdeck, so we decided to install it as well (Xray 301169), mounted on 1mm shims. Before installing the top deck, I quickly put the HiroSeiko motor pinion on as well. 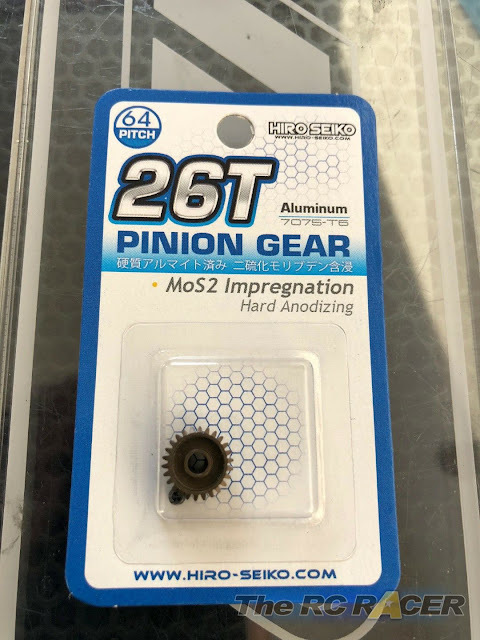 I didn’t know Hiro Seiko made pinions, but theirs are hard anodized, so we had to give it at try as well. When Florian started racing, we opted to use Hobbywing electronics. Hobbywing not only makes great motors and speedo’s, but they also have the easiest and more intuitive app to program the esc. You can virtually change all the different parameters in super small increments. The best thing about it, is that you can actually feel the difference, so the software is really top notch. 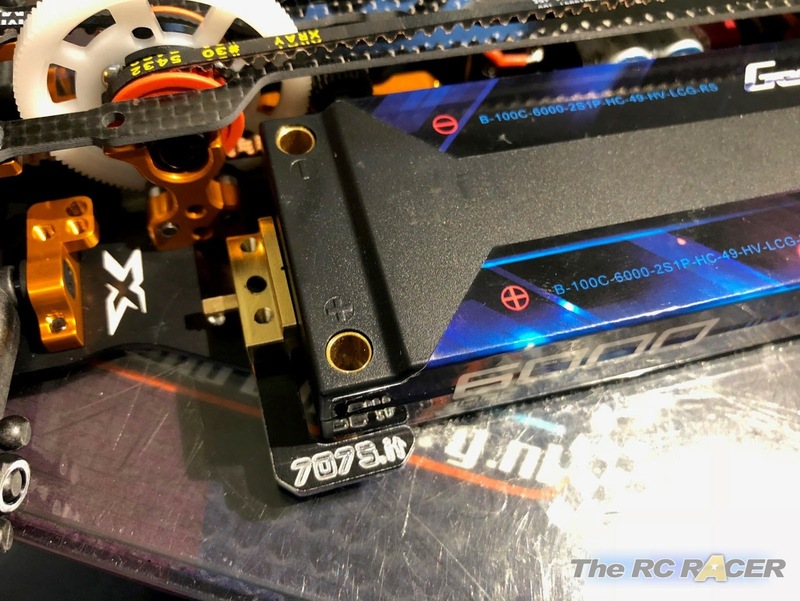 In a future article, we will make an in-depth review of the Hobbywing ESC and Wifi module. 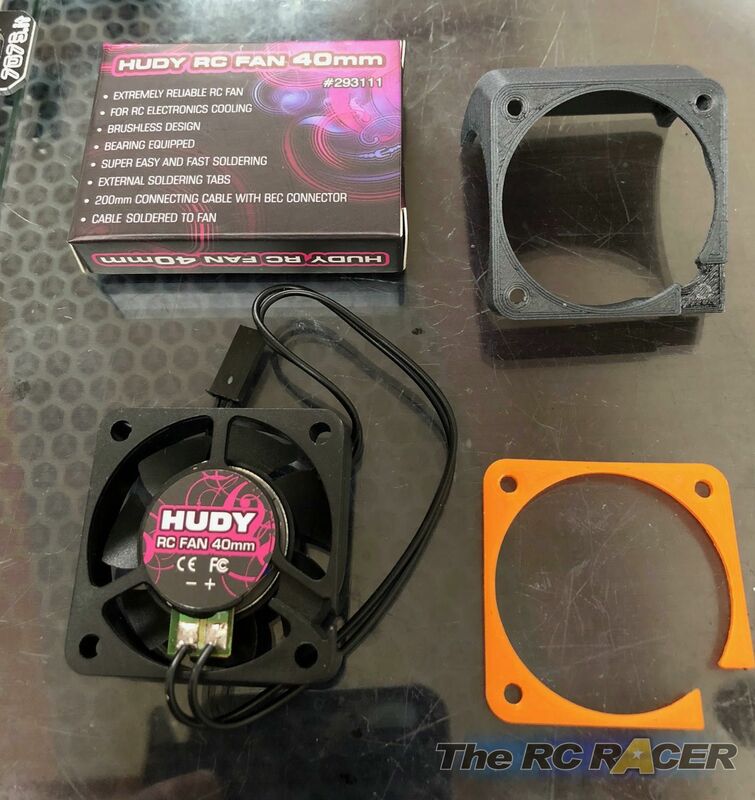 The Hobbywing XR10 pro comes with a really beautiful fan protection. It sits however quite high, so I decided to take it off, together with two steel screws. This saved me 1.85 grams. 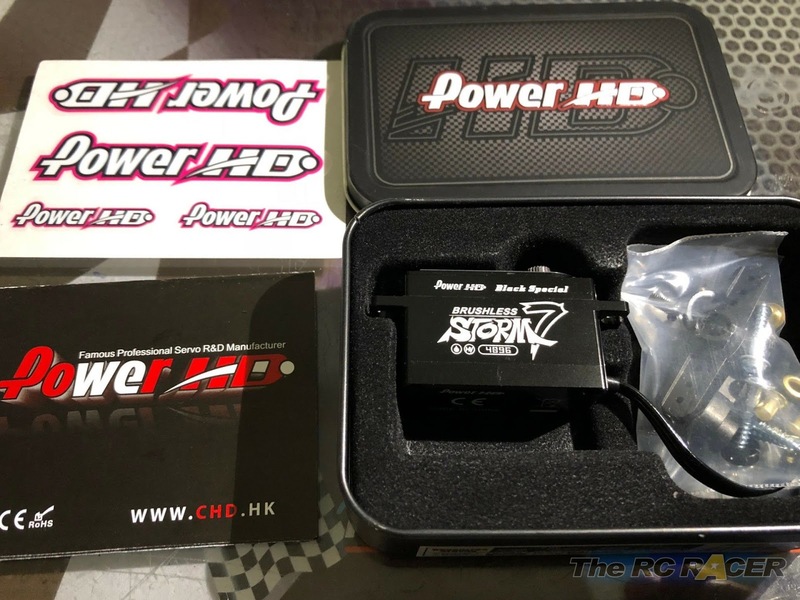 As a servo horn, I choose the PowerHD one. It is specifically designed for the Storm 7 and has 2 fixing screws to fix it to the servo. By now, you probably know I’m quite biased to keep the weight of the car as low as possible. That’s the reason why I decided to buy some brass weights of 7075.it, an Italian company which makes some really neat stuff. 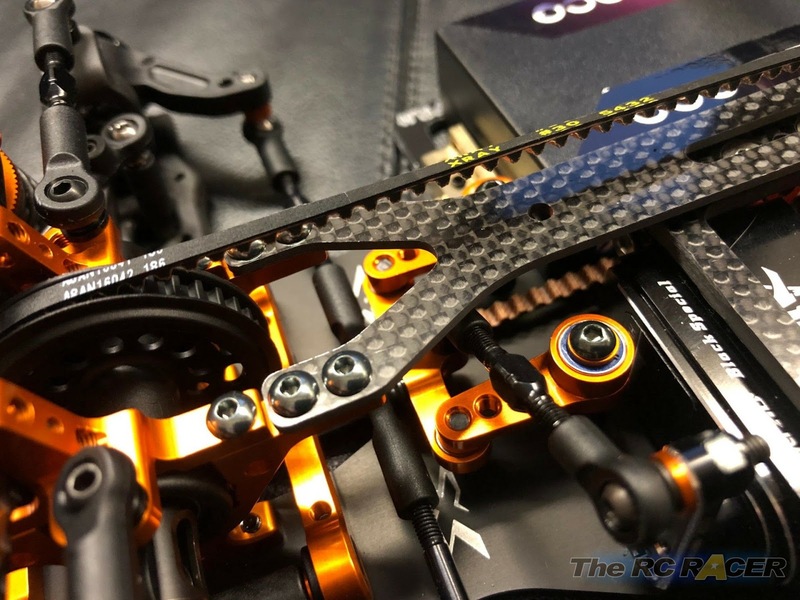 One of their great products is the servo mount insert. 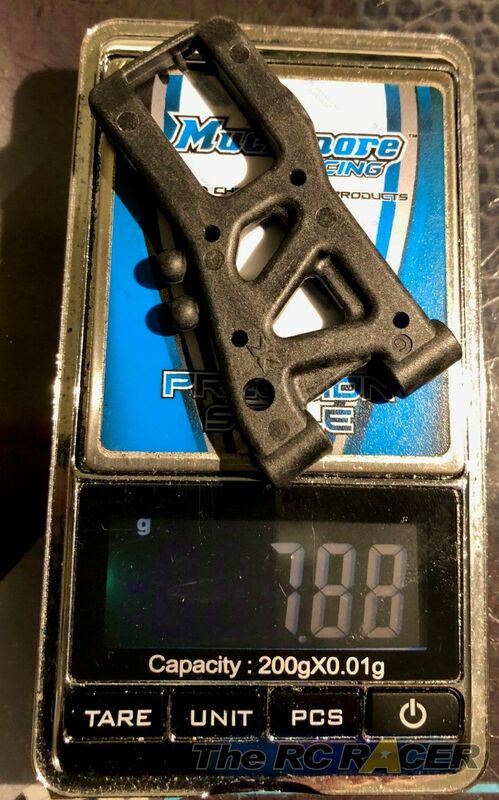 This part weighs 8.5 grams and sits quite low. I gave it a quick polish to make it look even better. 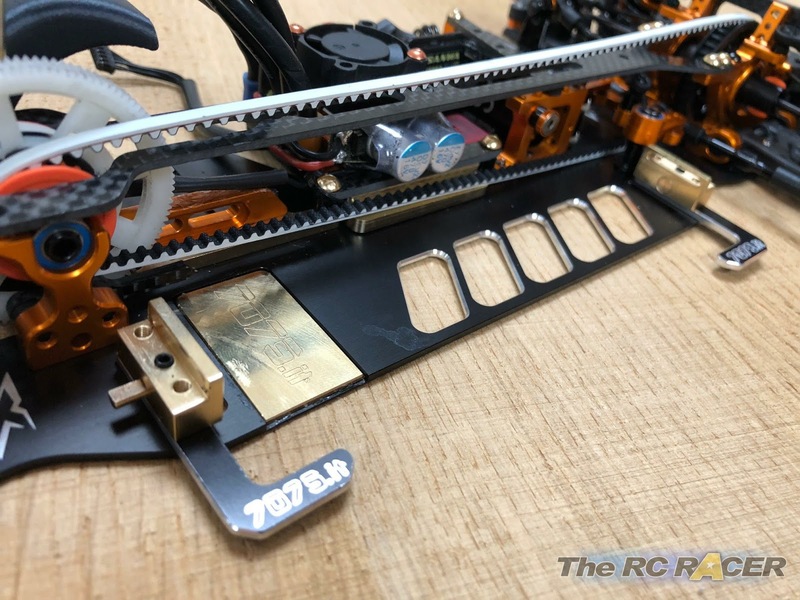 Also from 7075.it is the brass battery mounting system. 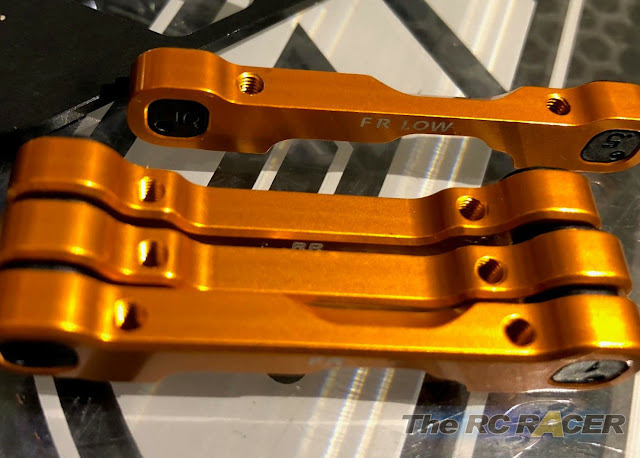 It features an aluminum angle coupled to a brass weight. 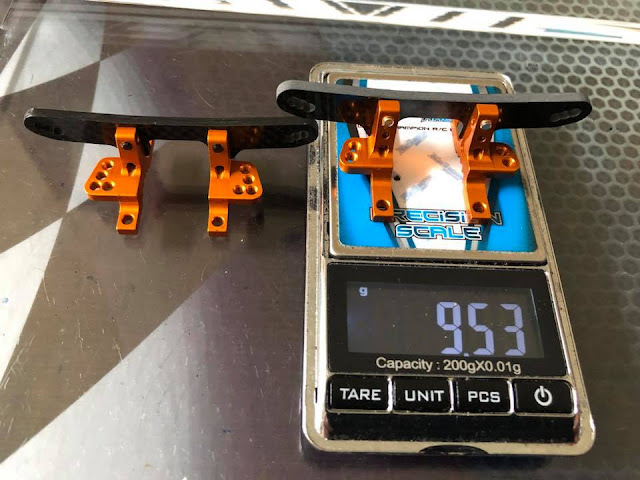 This weight not only allows you to use shorter battery tape, but also to move your battery forwards or backwards to give more steering or more traction. It’s a really clever design. So, with the build of the car done, here are my first thoughts. It is true that the car is not cheap and that there are many options for it. You don’t need to buy all of them however. 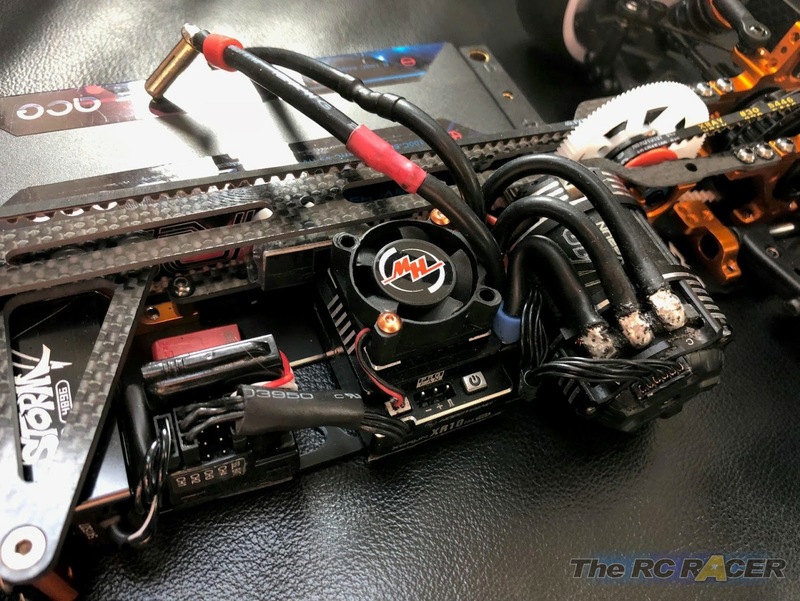 I think that the parts mentioned in the article are the main ones for mod racing. 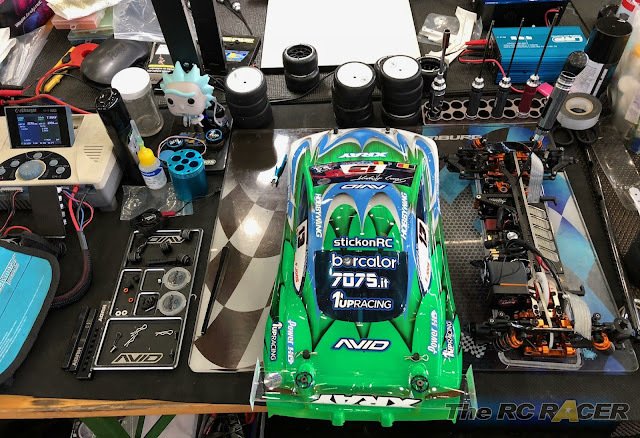 I hope to finish the stock car soon and make a small article on those specific parts. For the price however, you get a great racing car. It truly is a pleasure to build. All the parts fit perfectly and the quality of the aluminum and other components is top notch. Xray also manages to improve the T4 year after year. It is true that other car manufacturers have more innovative designs, but the T4 remains one of the class leaders, supported by its success after winning the Worlds. The first time we raced the T4 2019 was at the Essex Winter Series in Deanes, UK. 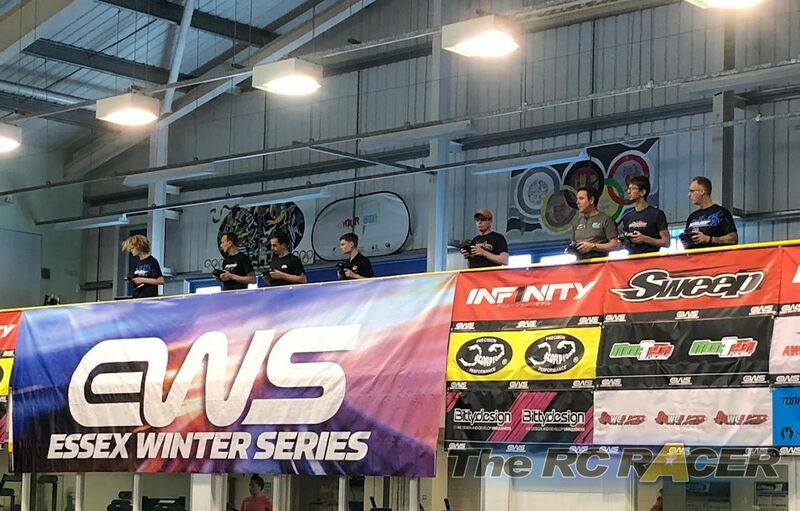 The EWS is a series of 5 indoor races on ETS carpet. 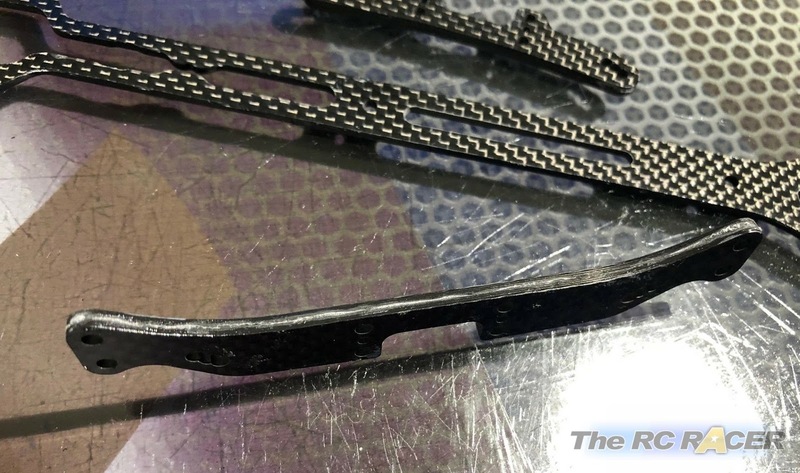 The tire used is a spec tire from Sweep with additive limited to a number of makes. These races are very competitive and attract the best UK drivers and some foreign drivers. What makes this event so nice is that it is a one day event, with 1 free practice, 4 rounds of qualifying and 1 final. When we participate at this race, we take the ferry at around 4am so that we arrive just in time for the track to open at 7am. 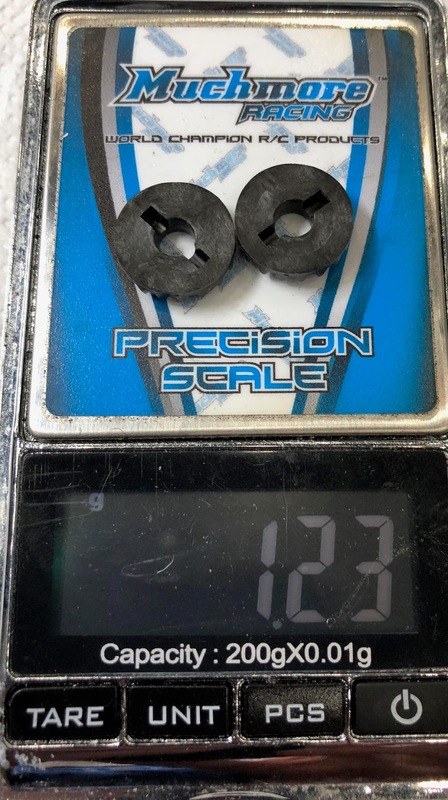 When we arrived at the track, we immediately purchased the spec tires, adjusted the ride height and checked the weight of the car with these tires. We then went to scrutineering for the spoiler and motor to be checked. In modified, there were around 30 drivers. During the free practice, Florian checked if his car tracked straight and adjusted his transmitter to his liking. This was the very first time he ran the car, so he was a bit anxious. The car went very well, but we didn’t see any times because we used a newer Mylaps transponder which isn’t supported by the timing system used by EWS. In the final, Florian’s car was ok, but a bit slower than in the last qualifying. We suspect that the tires are best after 3-4 rounds and that they start to wear off afterwards. Florian was a bit unlucky at the start and dropped to P10. He then climbed his way back to P5 before clipping a kerb and dropping down the order again. In the end he finished in P6. 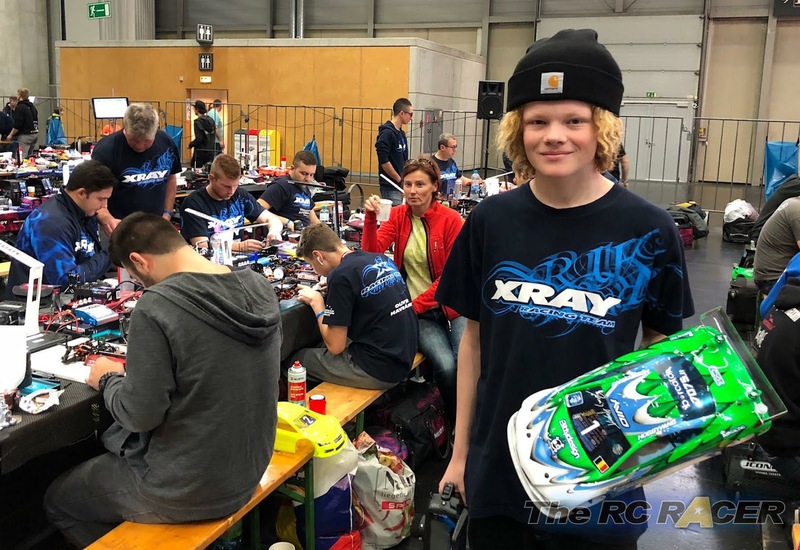 Unfortunately Alexander Hagberg, who dominated qualifying, had a problem with his car and had to withdraw from the race. 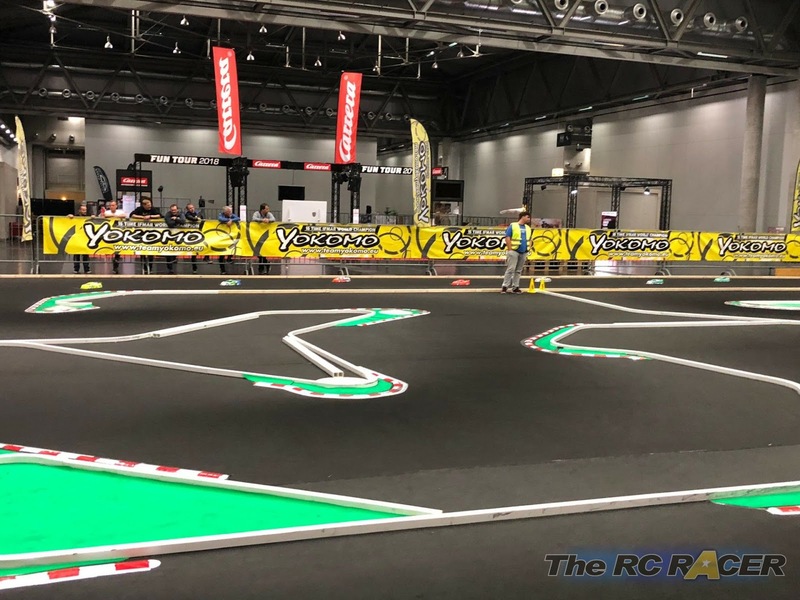 The first race of the ETS season kicked off at the Modellbaumesse Wien. This fair is an ideal showcase for our hobby as it attracts a large number of visitors. The track was quite technical with no so many passing opportunities. We raced the Xray T4 19 car in mod and the T4 18 car in stock. 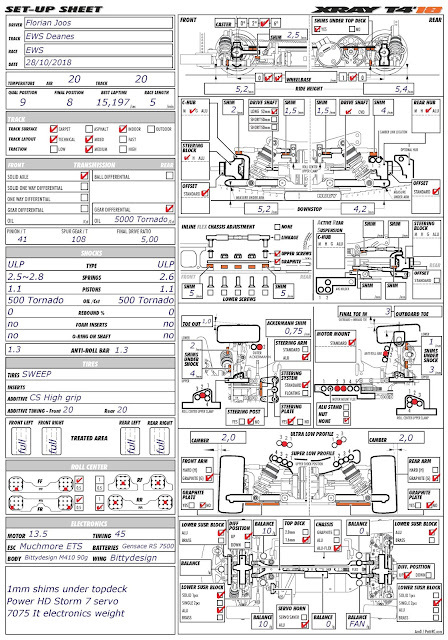 I will add the set-up sheet for the stock car as well, but give a bit more in depth information on the 19 car. During the first practice sessions, Florian had a good feeling with the car. He managed to reduce his deficit to the fastest driver, Bruno Coelho, from .7 seconds to .5 seconds per lap. We however decided to run in both our sets of allocated tires in the practice sessions, as the Volante tires get better after 2/3 runs. Florian was complaining about a lack of initial steering. 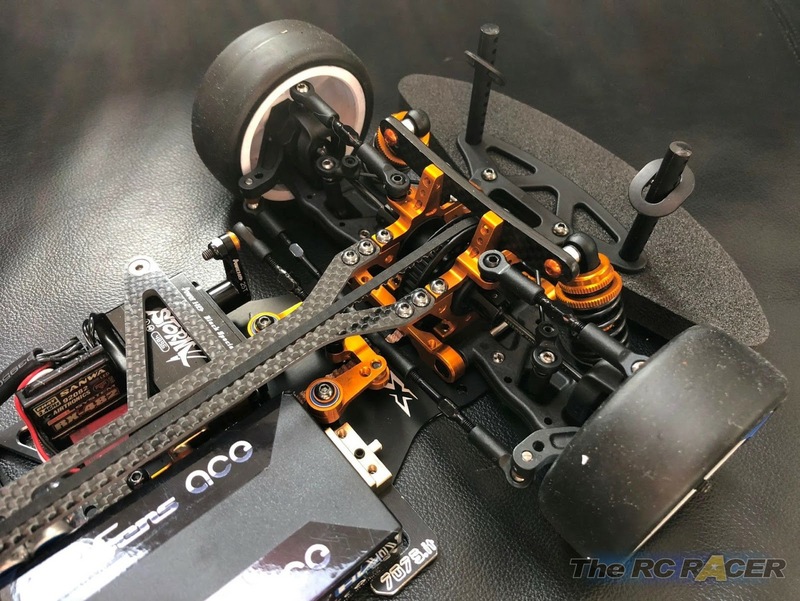 We opted for the Protoform Type S body instead of the Montech Racer body to get a bit more initial steering. 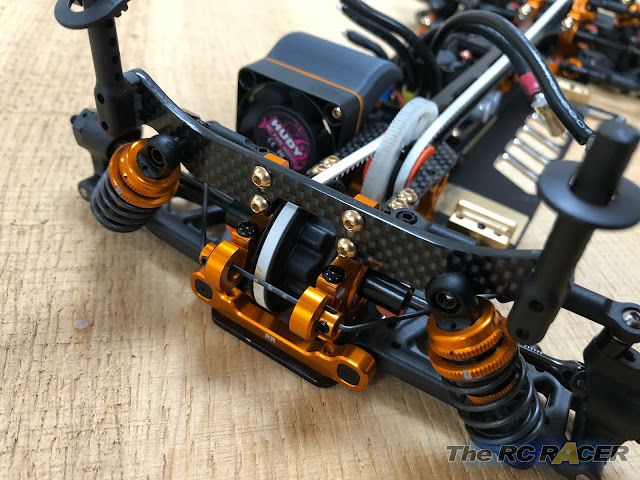 I also increased the Ackermann to 0,75mm and the bumpsteer to 3,5mm. In Q4 we had the car more or less sorted as he was able to make a P19 run, which is quite excellent, moreover because all the topdrivers finished their runs. We made the car quite aggressive by running 1,25mm of Ackermann and lowering the roll center on the front block. 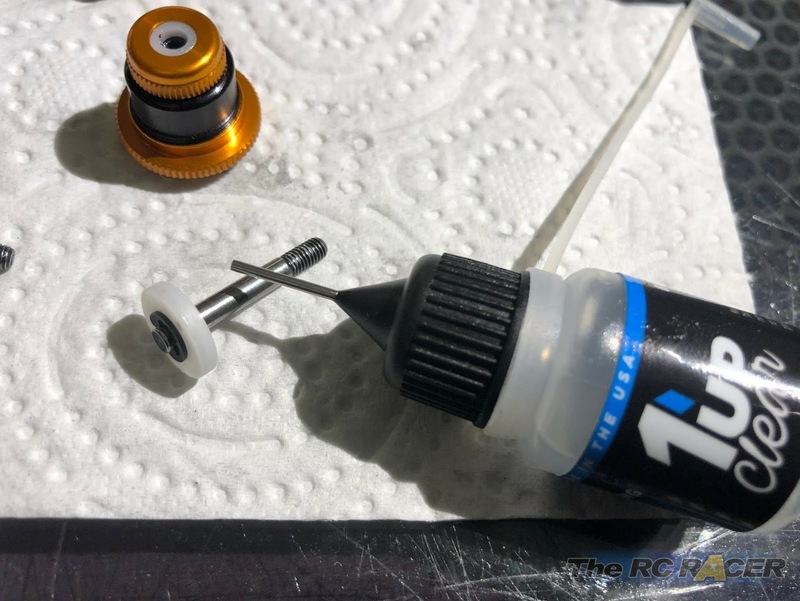 Alexander Hagberg also told us to use the kit supplied C hubs and axle holders (we were running the graphite ones). With his good last qualifying run, Florian managed to get a P26 overall position, which is his best ever qualifying position at an ETS. In the first final, he got caught up in the first corner melee and dropped to the back. The car showed good pace though, so we were confident for the later finals. After the finals, Lucas Urbain, a French top driver, told us that the track was changing every run. This was due to the foodtrucks in the hall that were working overtime :). Because of this, there was a lot of fat deposited everywhere (you could notice it on the chargers) and off course on the track. This caused the cars to understeer a lot more than normal. 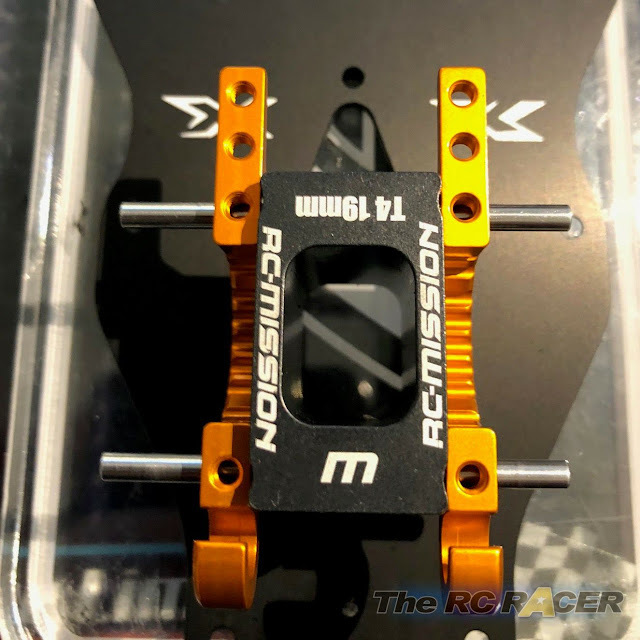 In order to get even more steering corner entry, I mounted an Avid solid RF block to stiffen up the front chassis and a low front suspension mount with a -1 insert. I however messed up the rear suspension and mounted the left and right dampers in a different hole. Florian told me his car was unpredictable and super difficult to drive, but he managed to get a P3 in that final. 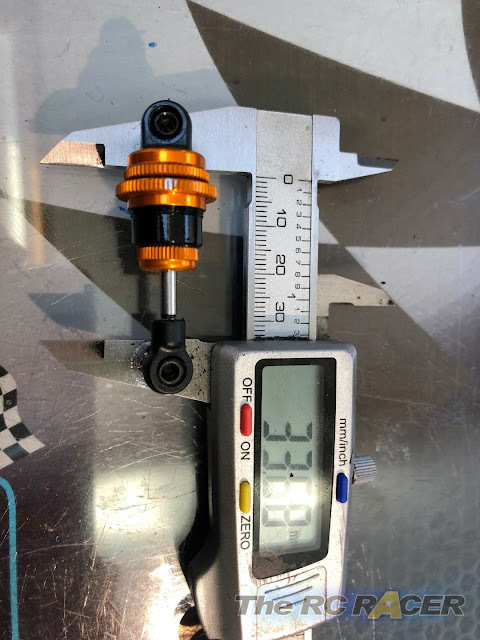 For the last final, I used 1mm Ackermans shim and reduced the length of the shocks to 8.5mm instead of 9mm. This time the car was really good, with only a slight hint of understeer. Florian climbed to the P3 spot, only to drop down the order again after a body tuck. In that race he recovered to P3 and set his fastest single laptime of the day. With that laptime, he was only .2 behind the winner of A3, Marc Rheinard. This proved that the car was working very well at the end. When looking at the final ranking, we noticed that the 3 youngest drivers (Oliver Havranek, Andrea Ghilotti and Florian) were all driving the Xray T4 car. 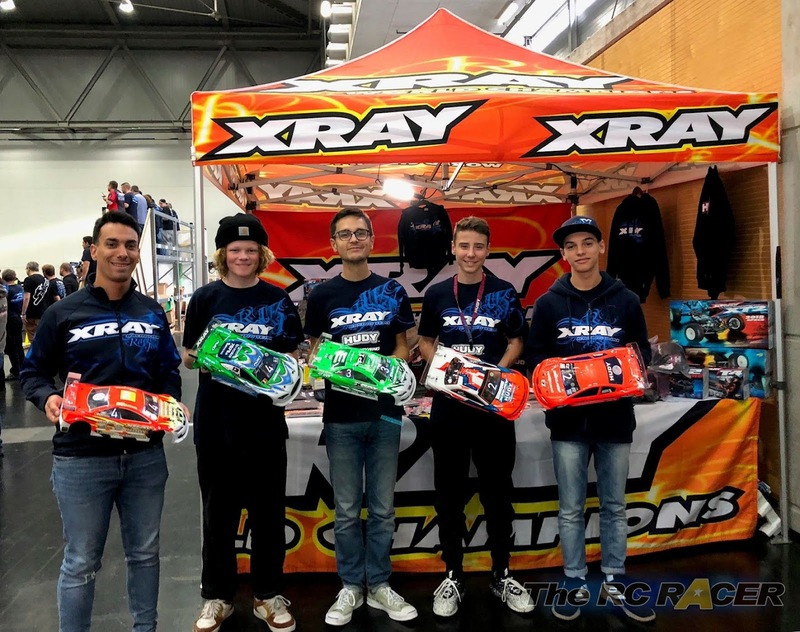 We are really happy that Xray not only supports the top drivers, but also invests time and money into young drivers. This is something that we really appreciate. Preparing a stock car is a bit different to a modified car. A stock car seems to have more steering then a modified car. A good stock car needs to have enough initial steering, but also a lot of corner speed. Too much steering on a stock car would kill the corner speed. Lowest possible weight – best possible acceleration, plus possibility to add weight where you want it to be. 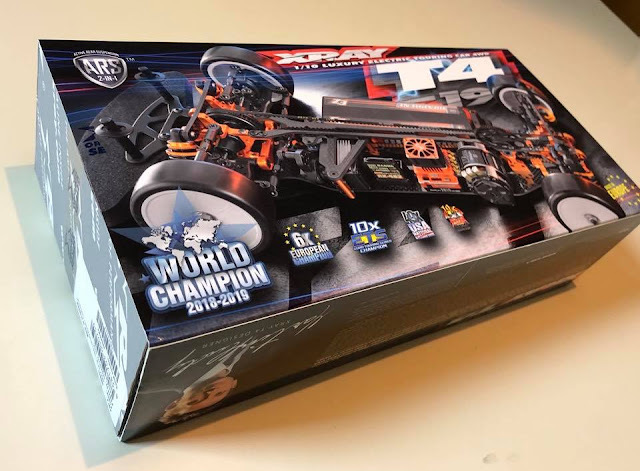 The T4 is a quite lightweight car, It is under the 1320g weight limit already in kit form. 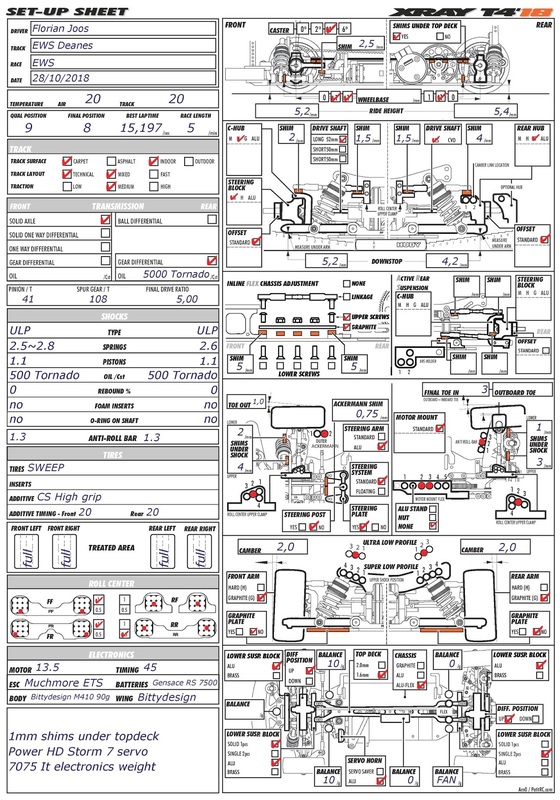 However I wanted to make the car as light as possible to give me more options on weight balance. 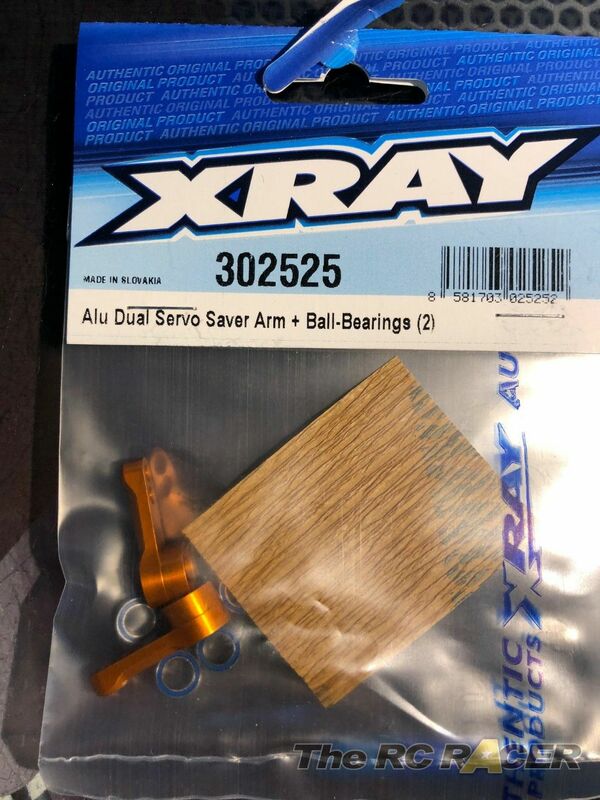 I added the Hiro Seiko aluminum screw kit (gold one this time) and Avid titanium ball studs. 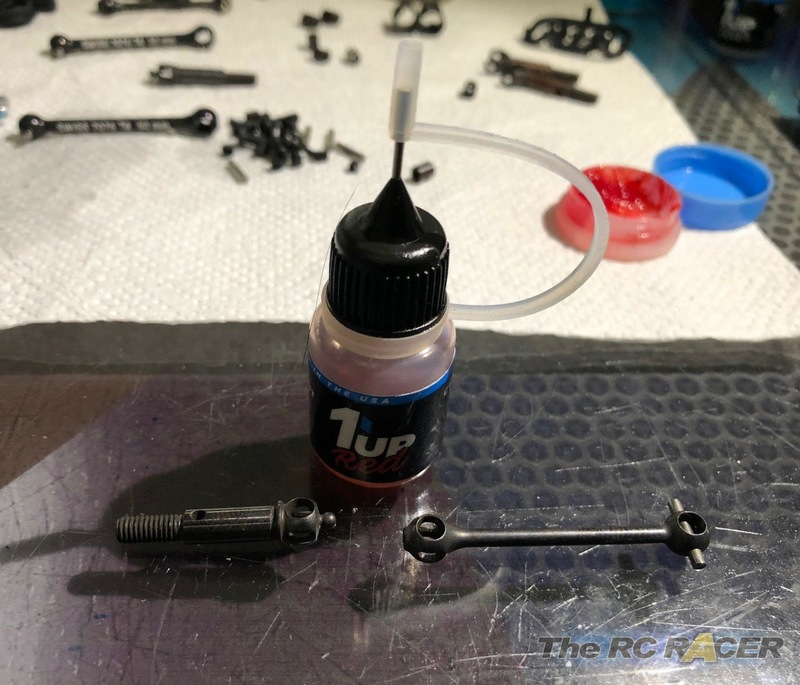 The aluminum screws and ball studs also help you to lower the CG, whereas the ball studs also have a beneficial influence on the un-sprung mass. 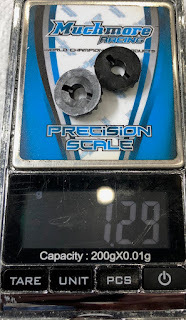 Also an interesting option are the titan pivot pins (307322 and 307222). It is super important to limit the rotational mass as this has a beneficial influence on the car’s acceleration. 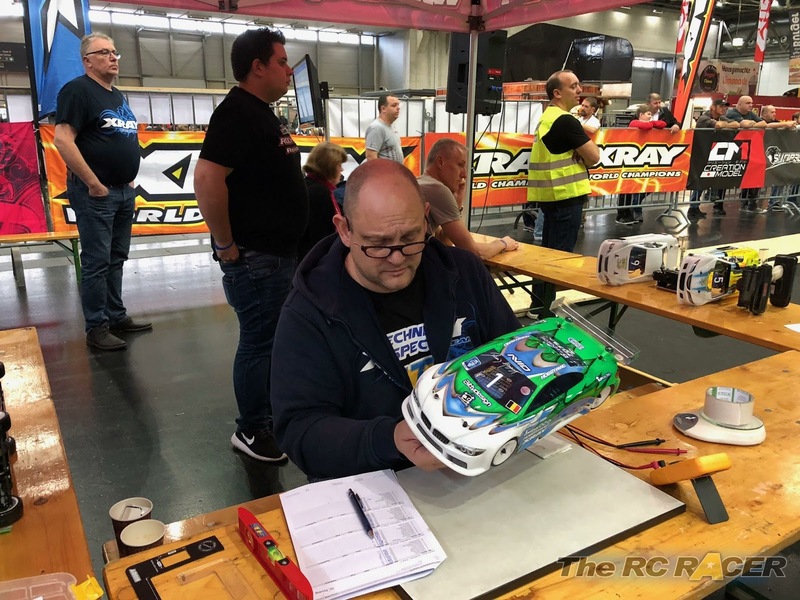 In the stock class, where the cars are evenly matched, this might give you an advantage. The lightest possible wheel nuts I could find are the Triad M4 Light Wheel Nuts. 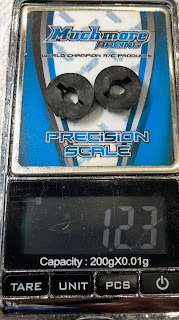 They come in a variety of different colours and only weigh in at 1.5g for 4. 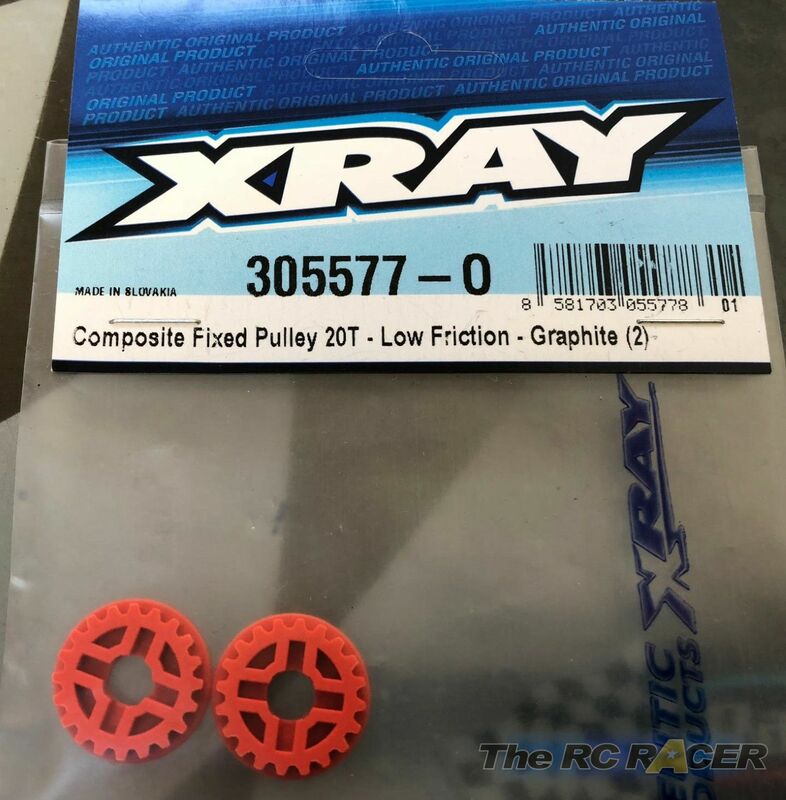 I also opted for the Xray graphite gear diff gears (Xray 304932) which are fractionally lighter then the stock ones (1.23 vs 1.29). 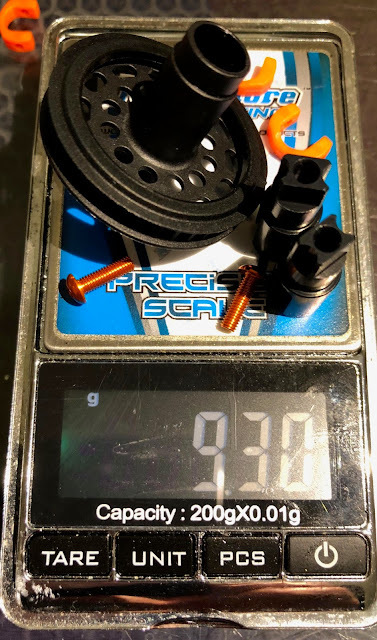 The front spool is quite light as it weighs only 10.45 grams. However we can go lighter. 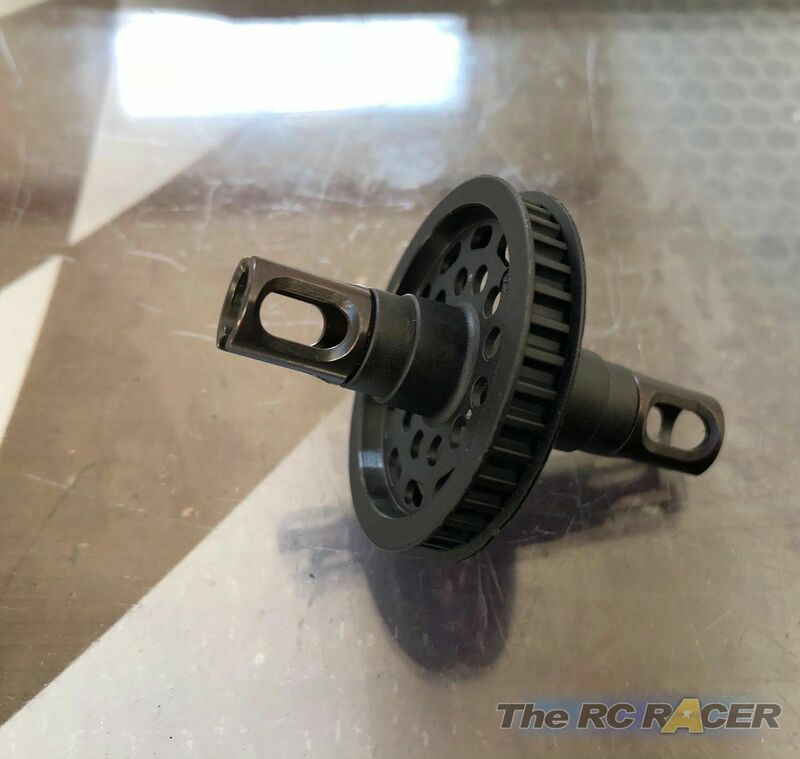 I replaced the kit parts with (Xray 305136) Alu solid axle driveshaft adapters and a 10mm alu screw (be sure to use some oil on the screw or thread a steel screw in the plastic first, otherwise you might round off the hex). I also used the (Xray 30542) Orange strong drive shaft caps. The result is an impressive 10% saving as you shave off over a gram. This was an easy one. 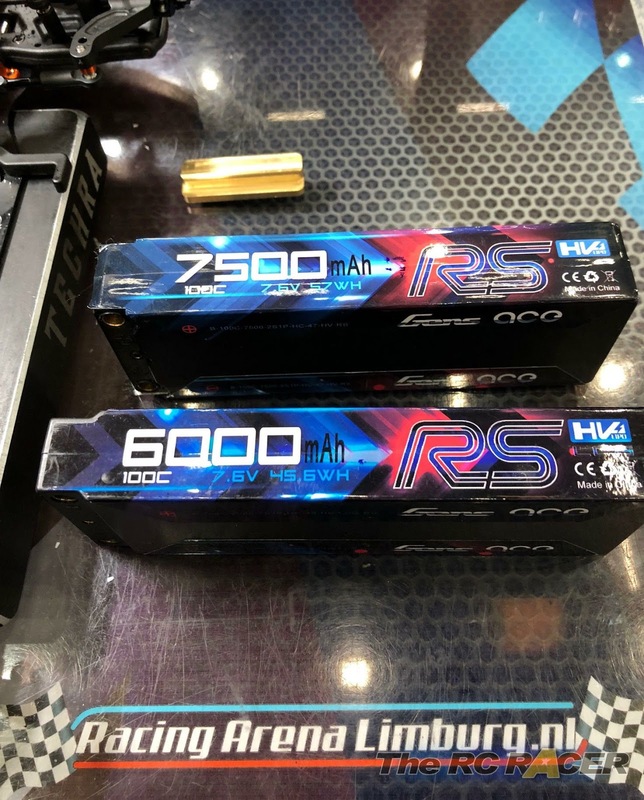 Florian was running the Gensace 7500 RS batteries. 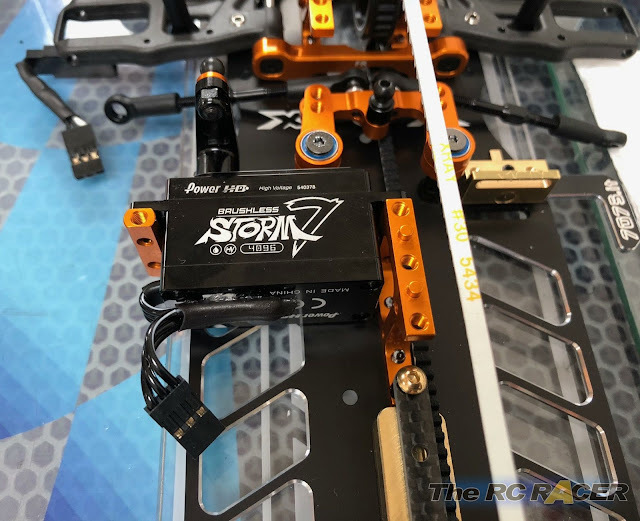 The extra capacity of the battery keeps the voltage more steady towards the end of the run. Most top drivers however use low center of gravity batteries. The faster corner speed is more important than the higher capacity. We switched from Gensace RS7500 batteries to the lighter RS6000 batteries. 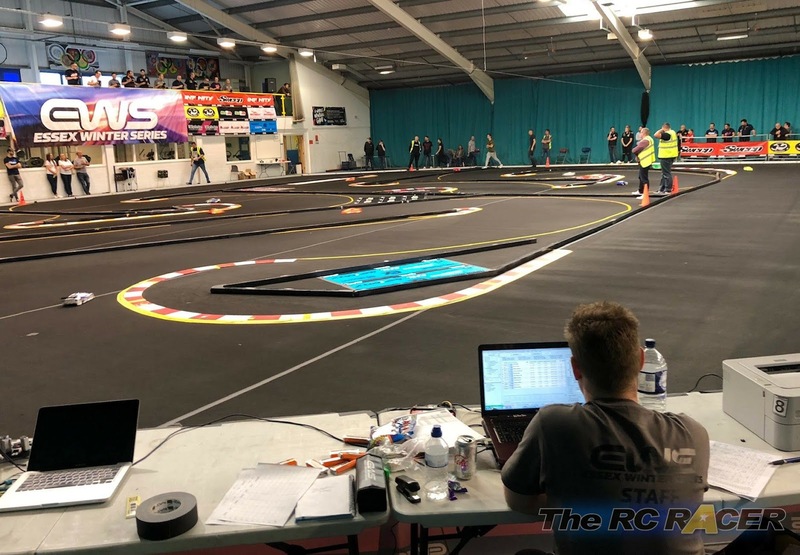 On the fastest lap-time, there was virtually no difference, but over 5 minutes the car was easier to drive fast with the lighter batteries. 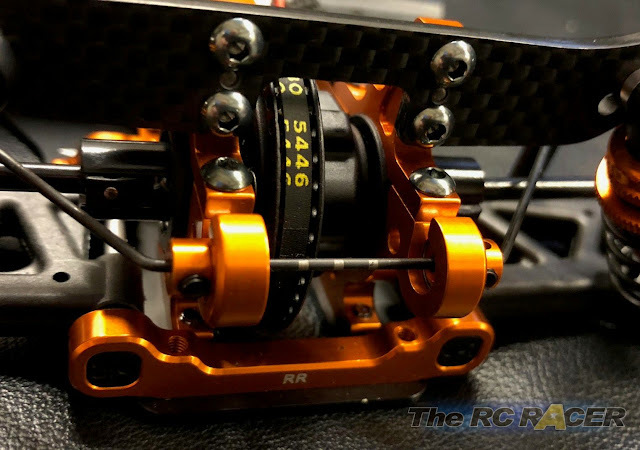 In order to compensate for the lighter weight, I used some great 7075.it product: the 8.5 gram servo mount insert, the brass battery mount system and the new 30g center weight. I omitted the weight under the electronics that is only used to balance the car with the heavier battery. While looking at the car, I also decided to ditch the 3mm floating servo holder. This part weighs almost 5grams and I replaced it with the 2mm graphite chassis stiffener (Xray 306530). We haven’t tested the car yet, but I think it will be ok to run it. 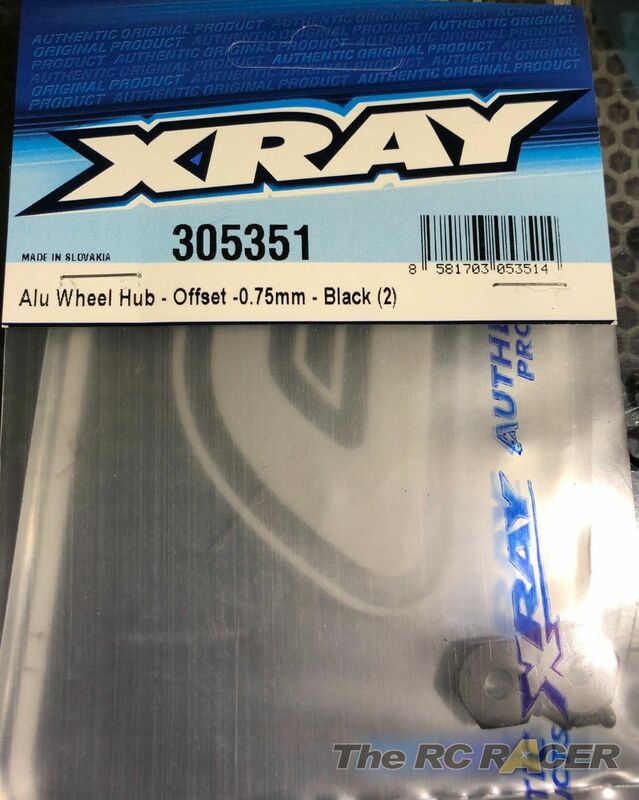 To reduce the friction to a minimum, I also opted for the alu adjustment ball bearing hub (Xray 302063) as it ideally positions the ball bearing for the drive train. 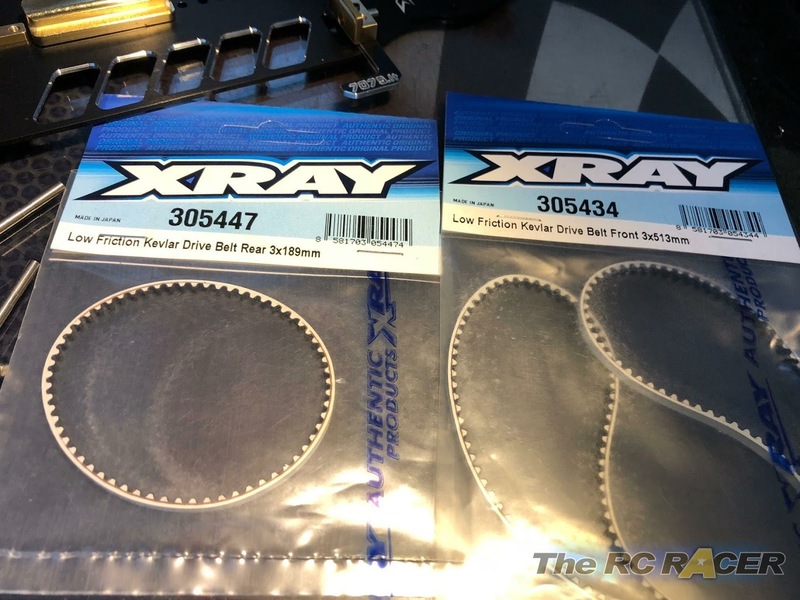 Instead of the standard belts, I used the low friction Kevlar drive belts (Xay 305447 and Xray 305434). Last time I used some shrink tube around the servo cable to shorten the cable. 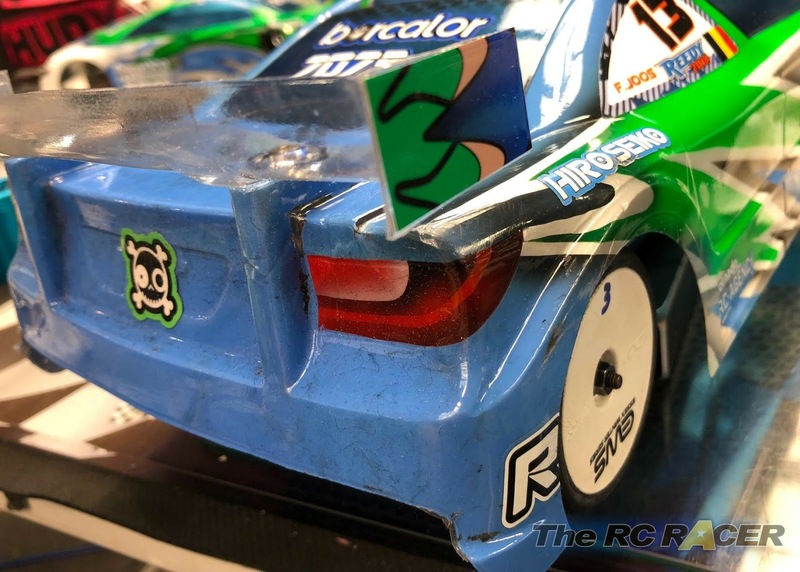 On the stock car, I glued the shrink tube on the servo (using Hudy body fix) so that it’s less noticeable. 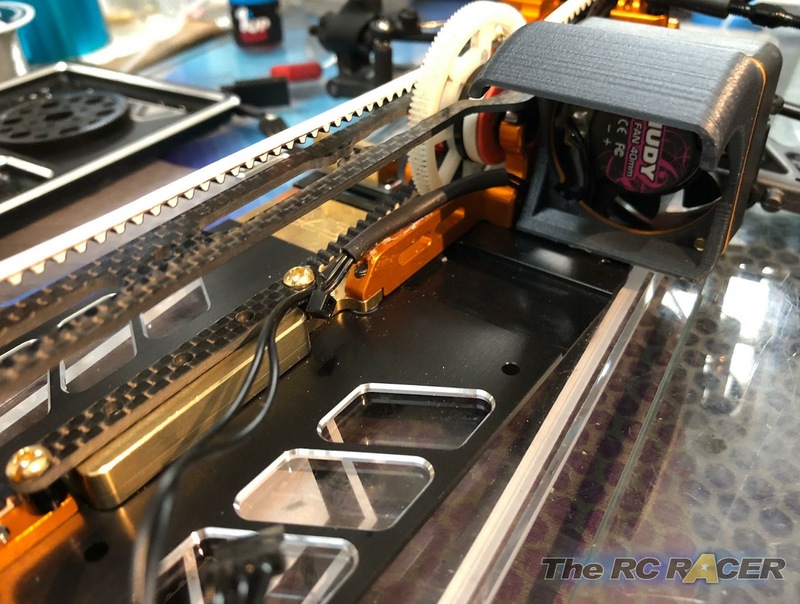 Monaco RC also makes a neat air conveyer (MC-AC40) for the cooling fans. This air conveyer conducts the air around the motor to keep the temperature down. To be honest, I always messed up the cabling of the cooling fan. 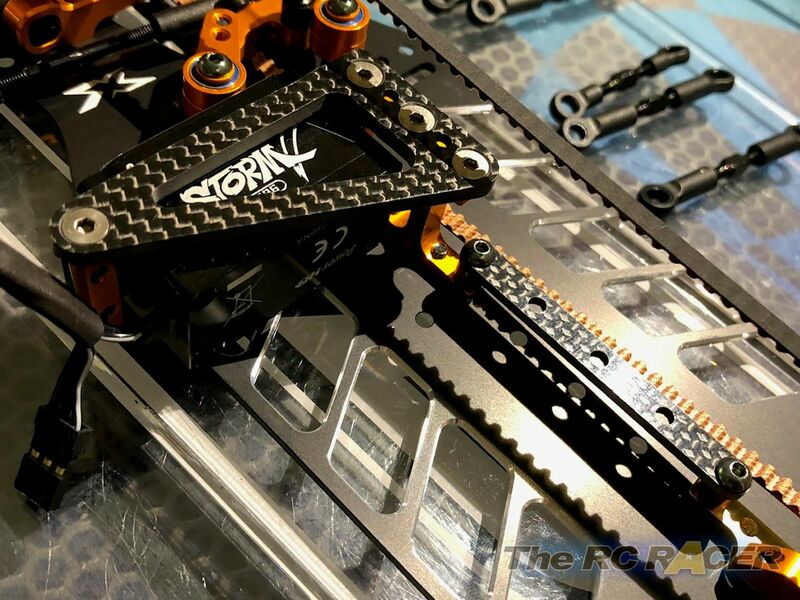 The Stock Xray T4 2019 is now complete. The drivetrain feels really smooth and free and I was able balance it perfectly on the scales. Our first test with the T4 19 will be the EWS, quickly followed by the ETS in Vienna. We will start with the setup from the 18 car and fine tune the car from there. 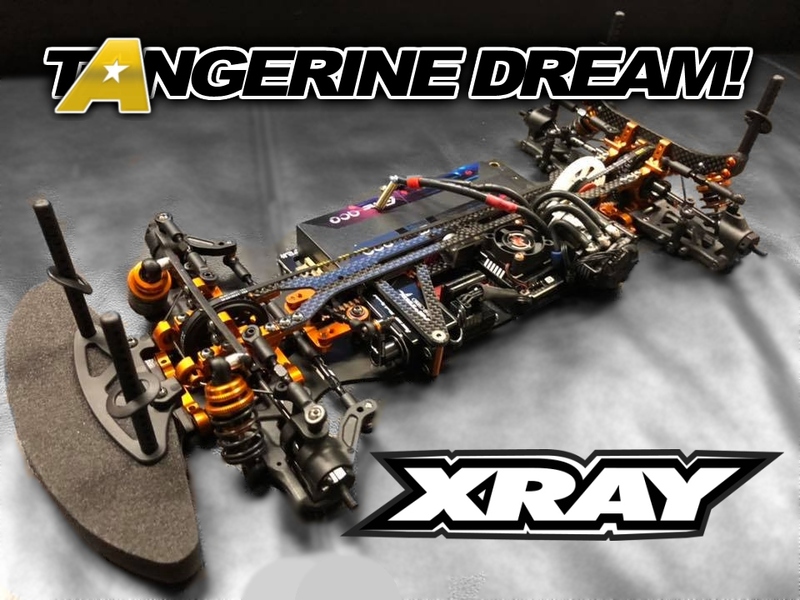 The Xray T4 2019 has impressed me so far. The quality of the components is superb and it holds together really well, even after some hard racing. Florian has improved on his times that he had previously set with the 2018 chassis. 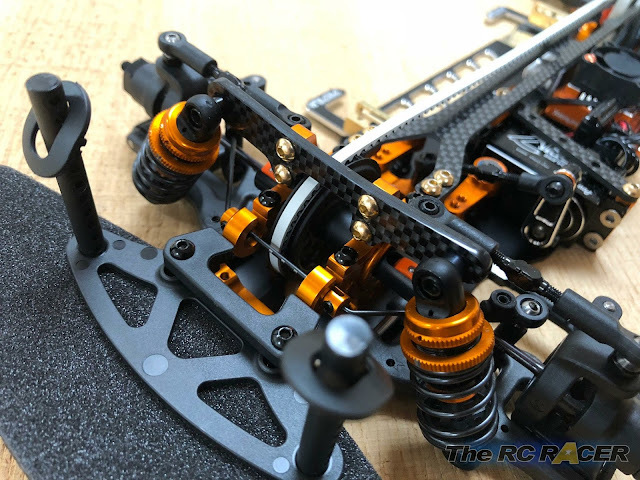 The chassis responds well to the different set-up changes that I have made to it, and it provides a wide range of different areas that can be tweaked and refined to accommodate specific track conditions or layouts. There is still a lot more speed to come from this chassis, be sure to check back as I will post further findings and set-ups over the coming months. One question. What is the thickness of the carbon fiber plate of the floating servo mount? For applying the CA glue around the edges of the carbon parts, I came up with an alternate idea, as opposed to using a flat screwdriver...a Q-Tip. It provides more even coverage, although one needs to be careful in doing it this way, so as to not get more than a super-thin bead along the edges (which, when sanding, will be removed).